On the whole, the weather over the last month has been just lovely for gardening here in southeastern Pennsylvania: not too hot, and not too humid, either. 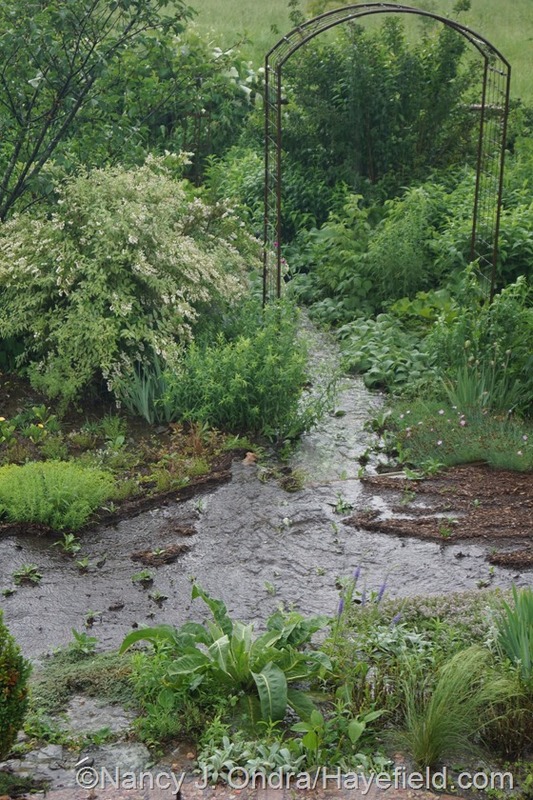 The fairly regular rains have been a blessing, as well—I haven’t had to water the garden once since I finished planting about three weeks ago—except for the deluge we got two days ago. I’ve thought about adding some sort of water feature to the garden, but not like this! 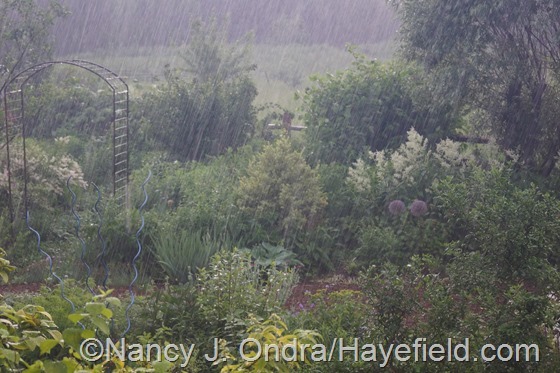 Of course, the storms had to come through the day before a photo shoot for a bunch of the container gardens I’ve been working on for the next book. Oh, well. In a few more weeks, I’ll probably be longing for a soaking rain again. Anyway, the garden has been pretty happy with the weather, so I have loads of flowery highlights to share from the last month. Let’s start with the annuals. 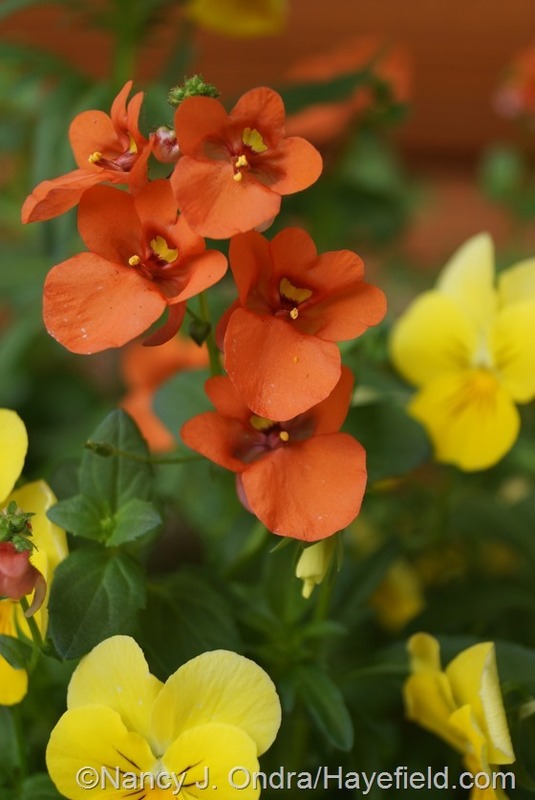 Below is Flirtation Orange twinspur (Diascia ‘Dala Oran’), still going strong from last month. 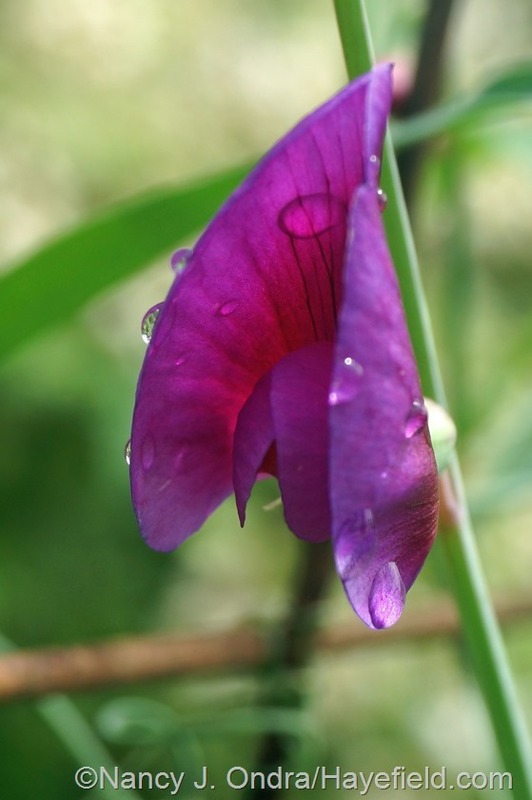 …and I’m pretty sure that the next one is Tangier pea (Lathyrus tingitanus). 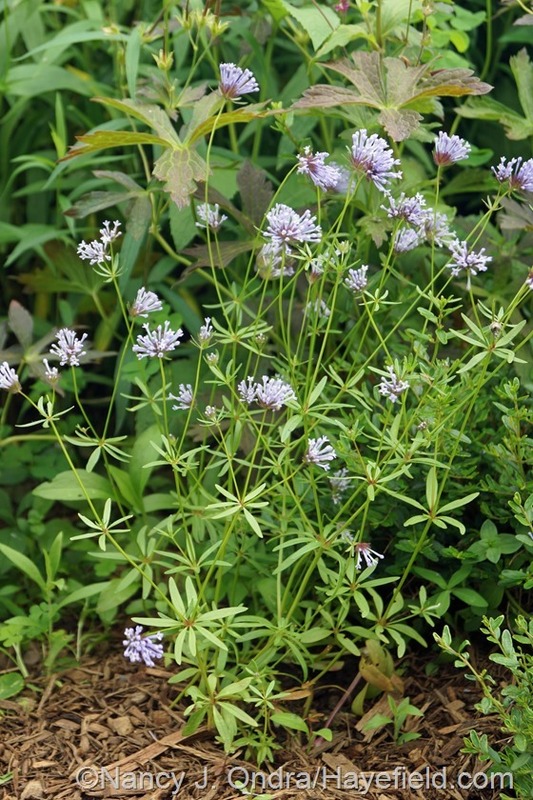 I have to agree with a friend’s assessment that blue woodruff (Asperula orientalis)–above and below–is not a “wow” plant, but I enjoy seeing it pop up in various places each spring. 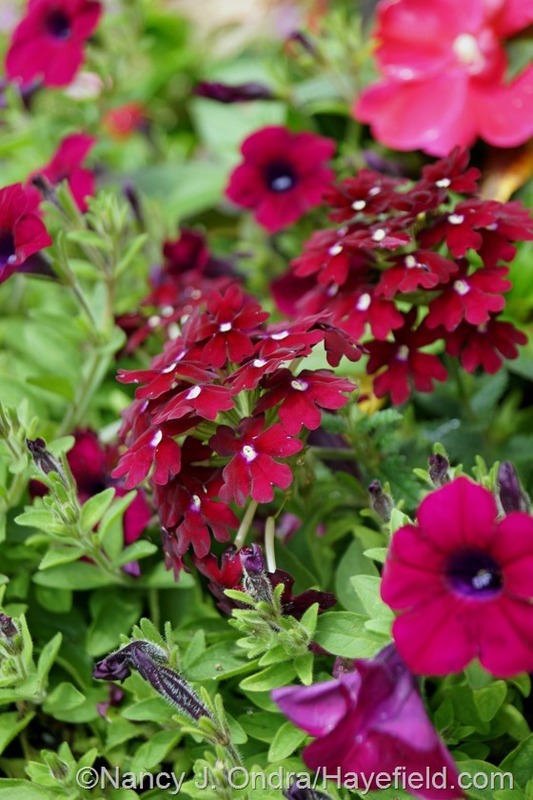 Below is a much more eye-grabbing color, from ‘Vivid Zinfandel’ verbena. It’s paired here with ‘Blanket Zinfandel’ petunia. 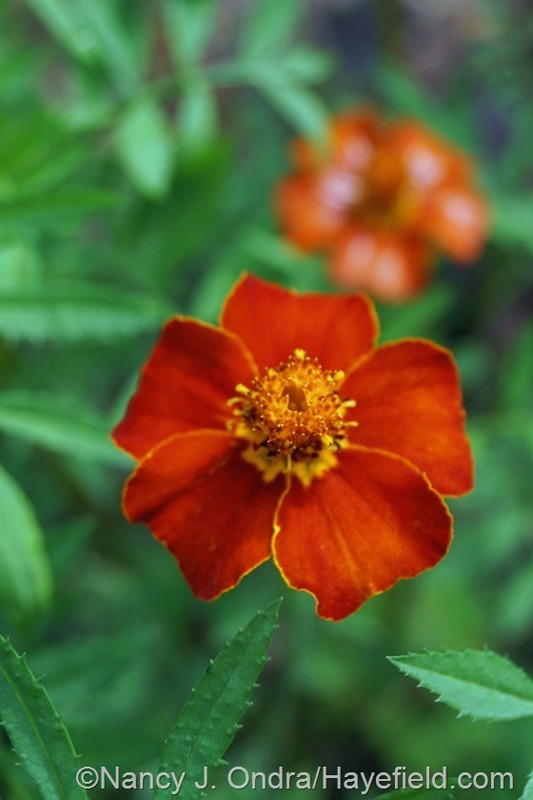 I was very pleased to find seed of ‘Cinnabar’ marigold (Tagetes)–above–in this year’s list from Special Plants, one of my favorite seed sources. This marigold will definitely be a keeper. 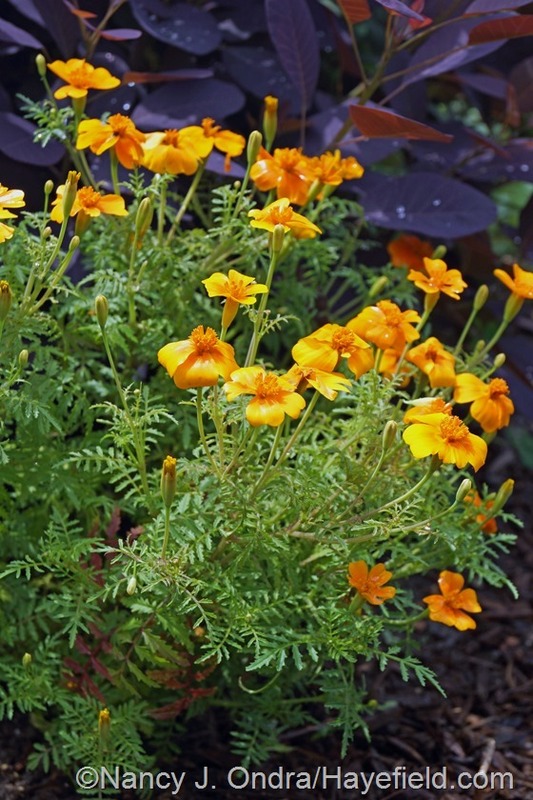 Below is another beauty in a much brighter orange: ‘Tangerine Gem’ signet marigold (Tagetes tenuifolia). 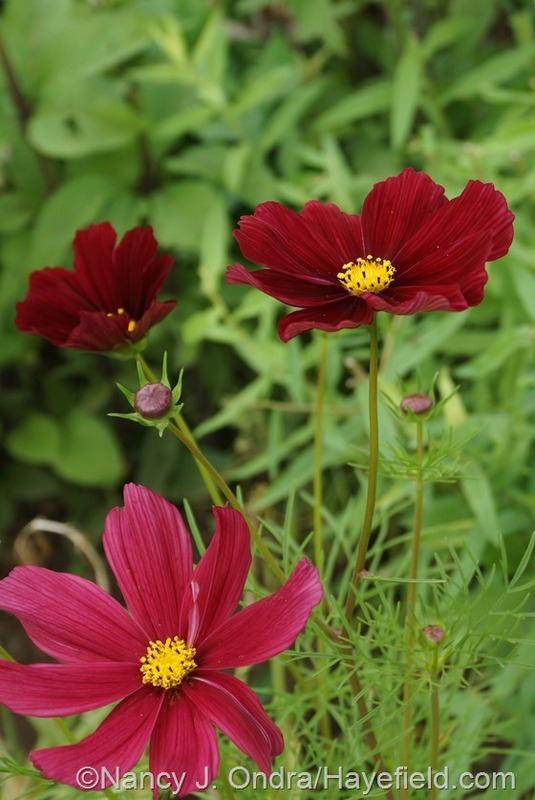 Below, another new annual for me this year: ‘Rubenza’ cosmos (Cosmos bipinnatus). 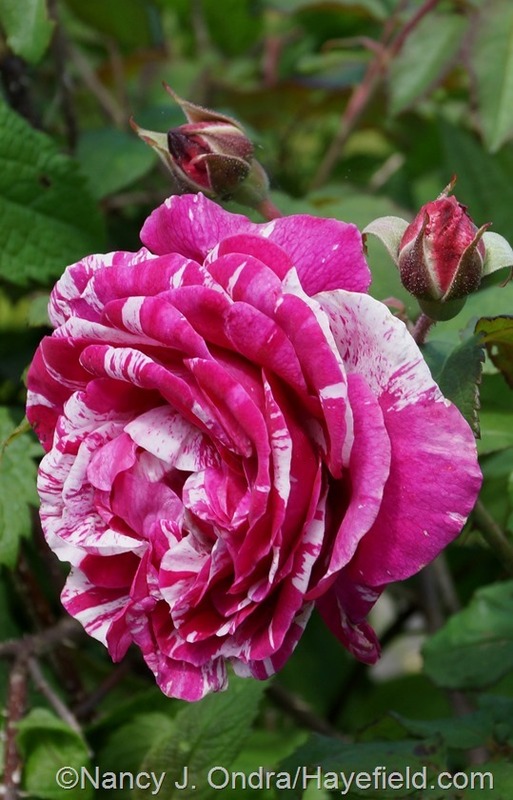 It opens velvety crimson and ages to a rich rosy pink. 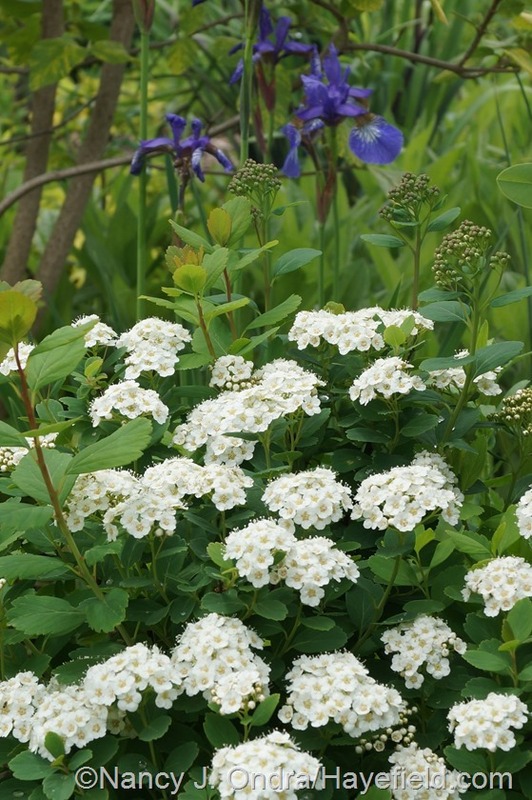 Above, white heliotrope (Heliotropium arborescens ‘Alba’) with a bit of Fiona Sunrise jasmine (Jasminum officinalis ‘Frojas’). 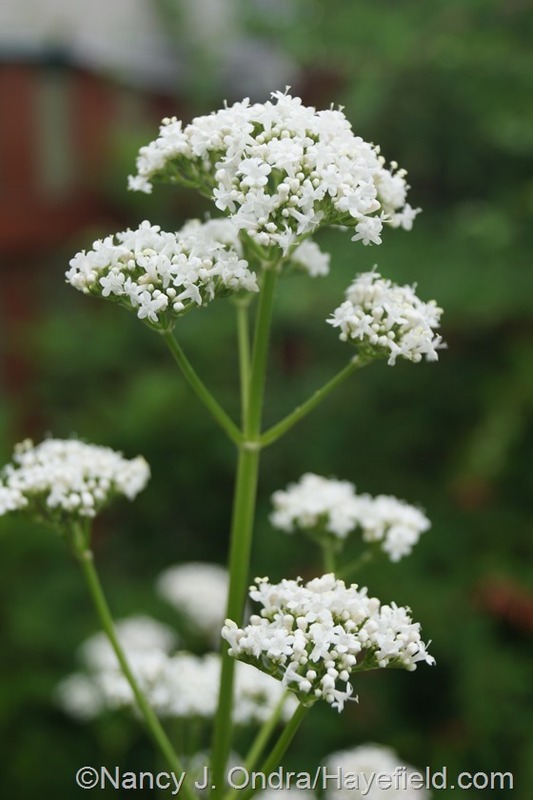 Below is hare’s ear or thoroughwax (Bupleurum rotundifolium). 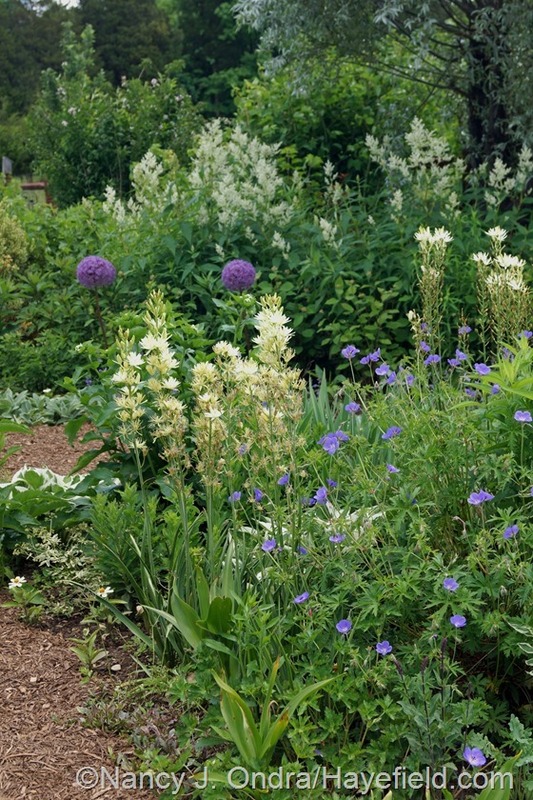 …and Camassia leichtlinii ‘Semiplena’, below with ‘Brookside’ geranium, ‘Gladiator’ allium, and giant fleeceflower (Persicaria polymorpha). Below, firecracker flower (Dichelostemma ida-maia). 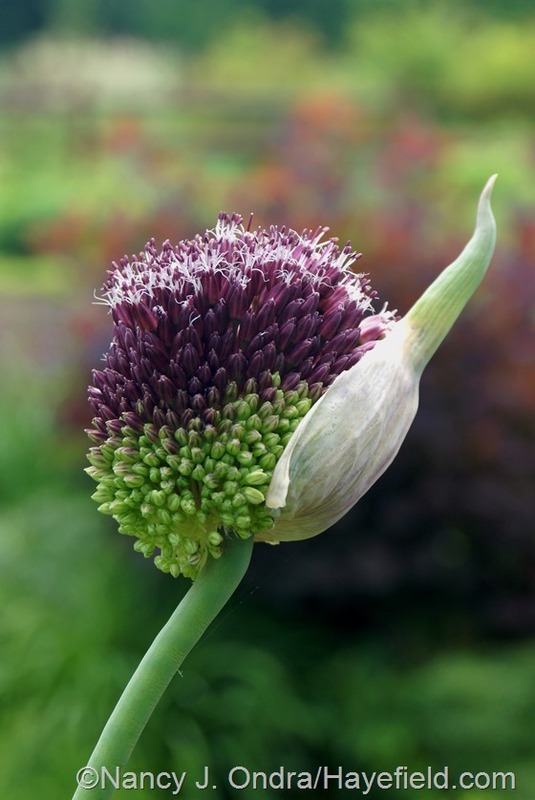 Above, ‘Forelock’ allium just now coming into bloom. 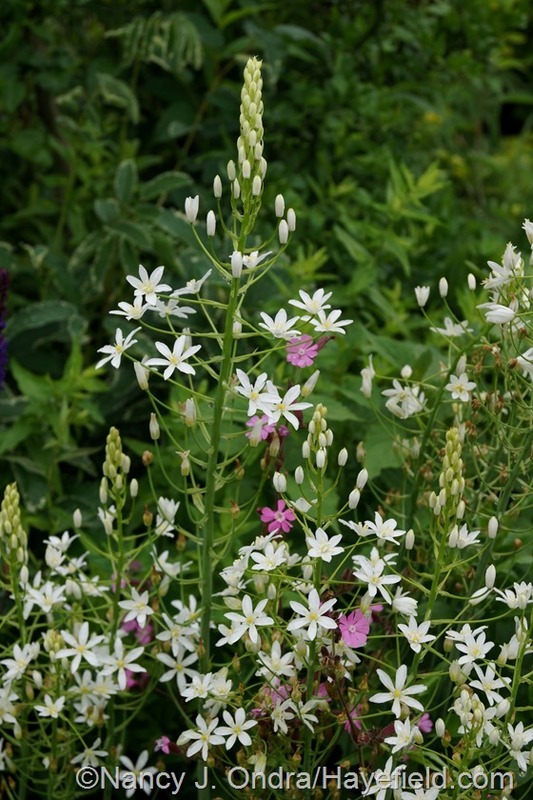 Below is Ornithogalum magnum, which has been in flower for about 3 weeks, mingling with red campion (Silene dioica). 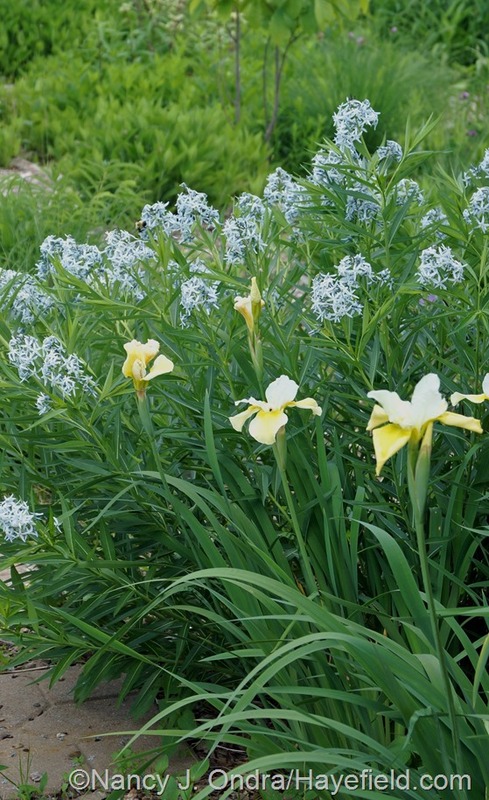 …and a couple of bearded irises, including a no-name orange with ‘Golden Foam’ euphorbia and golden elderberry (Sambucus nigra ‘Aurea’), and reblooming, white ‘Immortality’ below. 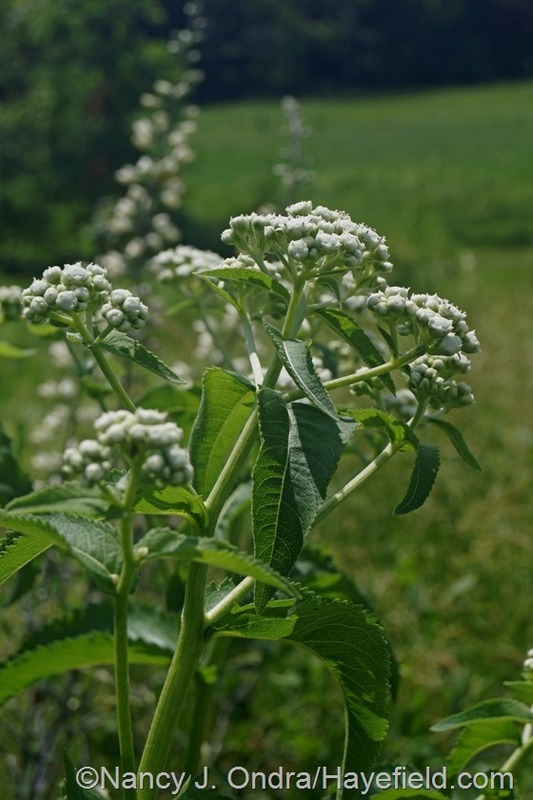 …and wild quinine (Parthenium integrifolium). 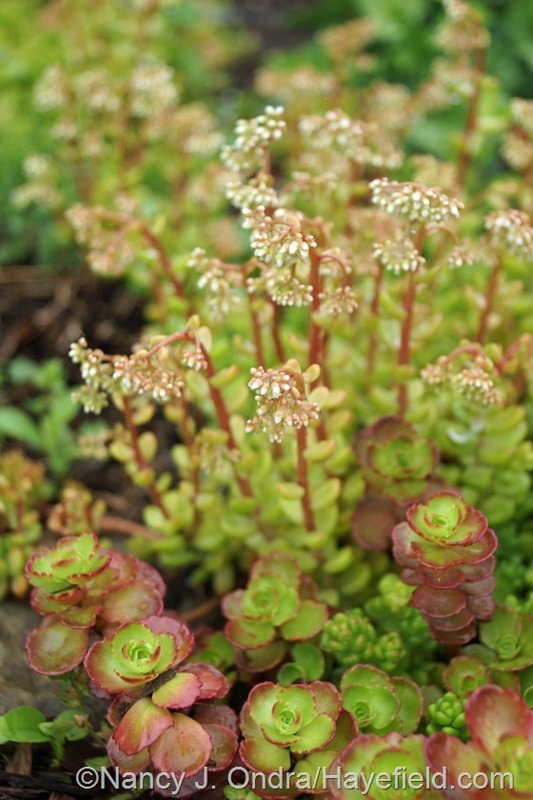 …and below, ‘Athoun’ white stonecrop (Sedum album) with ‘Elizabeth’ two-row sedum (S. spurium). 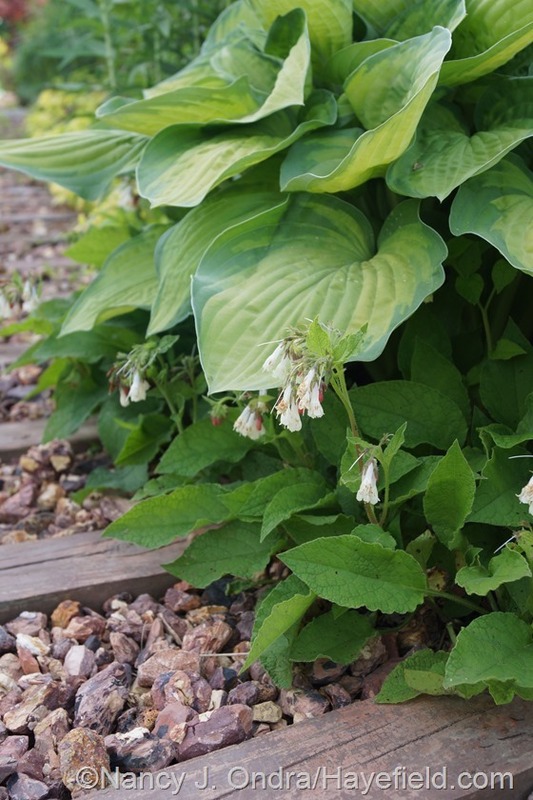 Dwarf comfrey (Symphytum grandiflorum), above, finished flowering about 10 days ago. 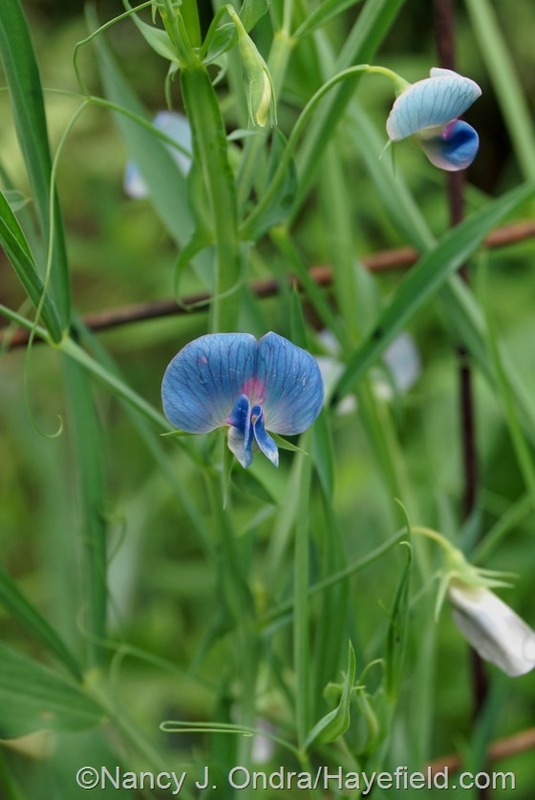 But across the path, there’s now what must be a previous year’s seedling from it, with blue flowers. I guess that’s how the cultivar ‘Hidcote Blue’ came to be, as well. 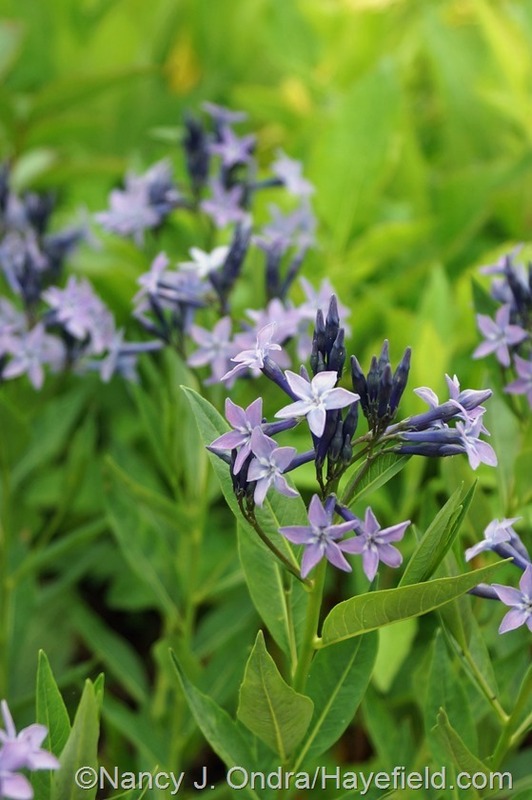 Bluestars (Amsonia) are some other sources of blue for late May and early June. 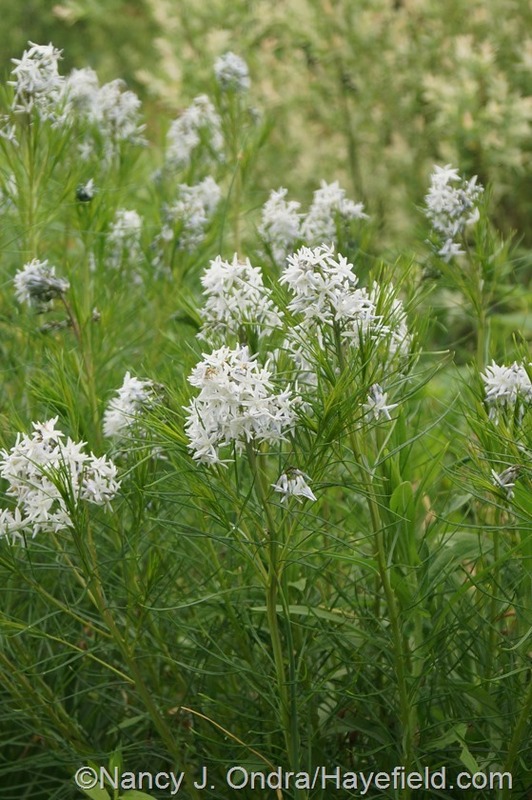 The first one to flower here, and the first one to finish, was one I grew from seed labeled Amsonia rigida. I’m not sure about that ID, though: it matches some photos on the Web but is completely different from others. The next one to open–and the only one that’s still going today–is ‘Blue Ice’. In the past, I’ve said that this plant is boring, but I have to admit that I’ve changed my mind. I apologize, Icy, you’re a very pretty thing, and I’m happy to have you here. 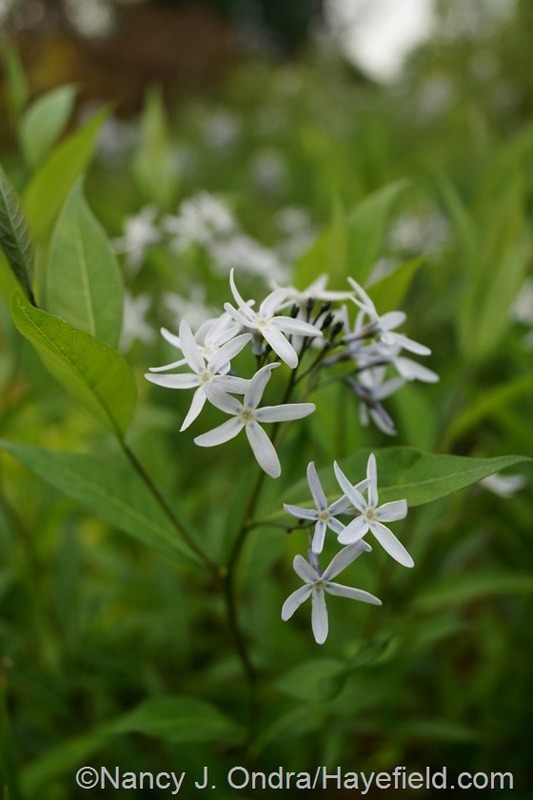 Above is a very pale Arkansas bluestar (Amsonia hubrichtii). 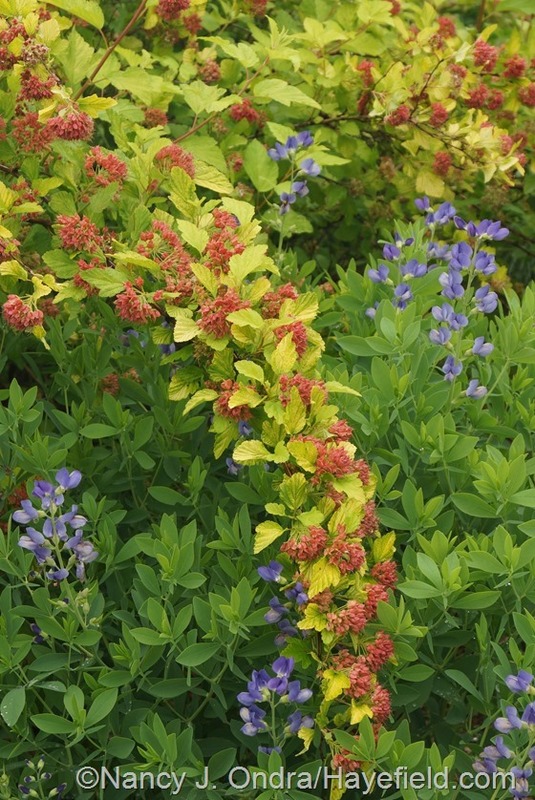 Below is a slightly bluer one, with purple-blue ‘Purple Smoke’ and soft yellow ‘Carolina Moonlight’ false indigos (Baptisia). 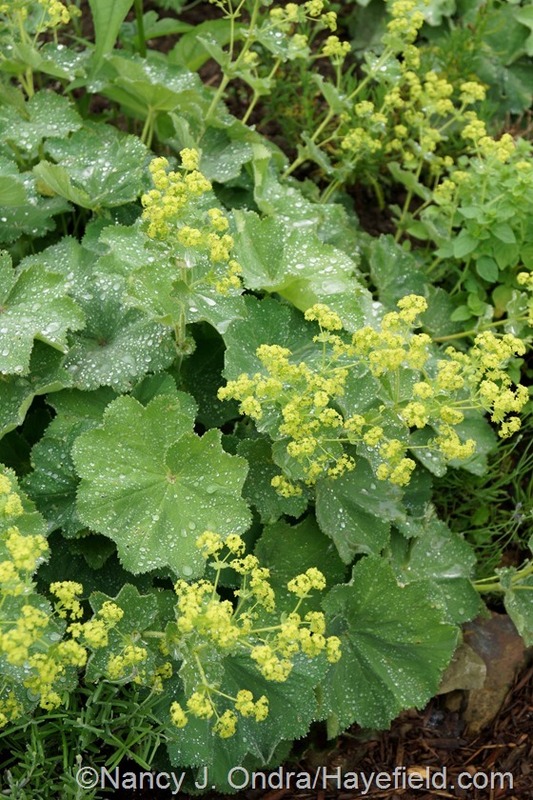 Some more yellows for this season include king’s spear (Asphodeline lutea), above, and lady’s mantle (Alchemilla mollis), below. 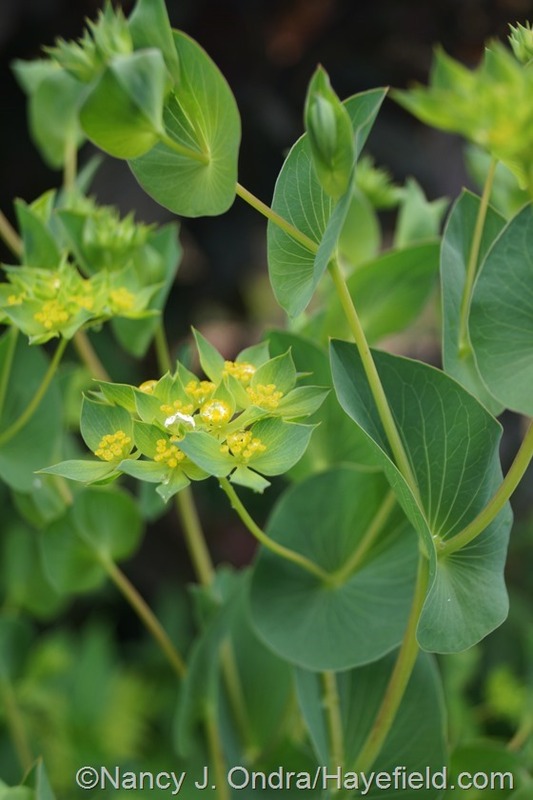 Above is Euphorbia palustris ‘Zauberflote’, and below is perfoliate Alexander (Smyrnium perfoliatum). I’ve been trying for ages to get this one going from seed and finally got one plant to flower, after four years. I wish I’d gotten some better photos of it! Now I can only hope for lots of seeds and lots of patience getting a new batch going. Maybe I’ll have more pictures for my June 2018 Bloom Day post. 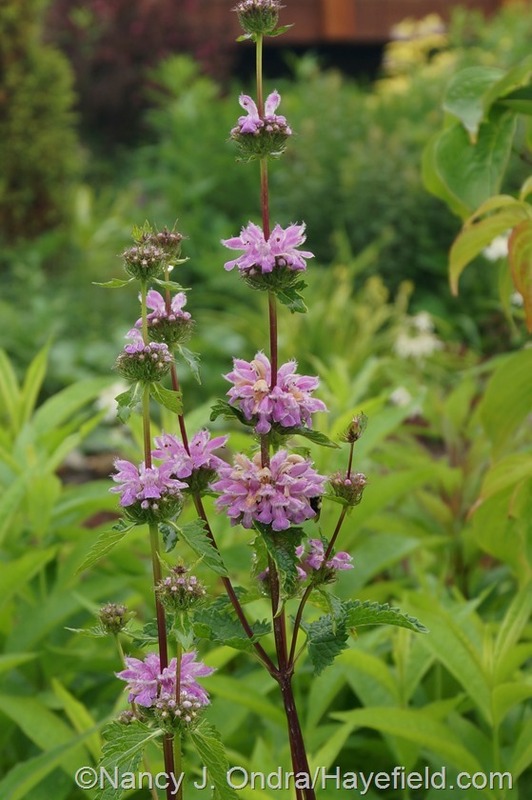 …and ‘Amazone’ tuberous Jerusalem sage (Phlomis tuberosa). 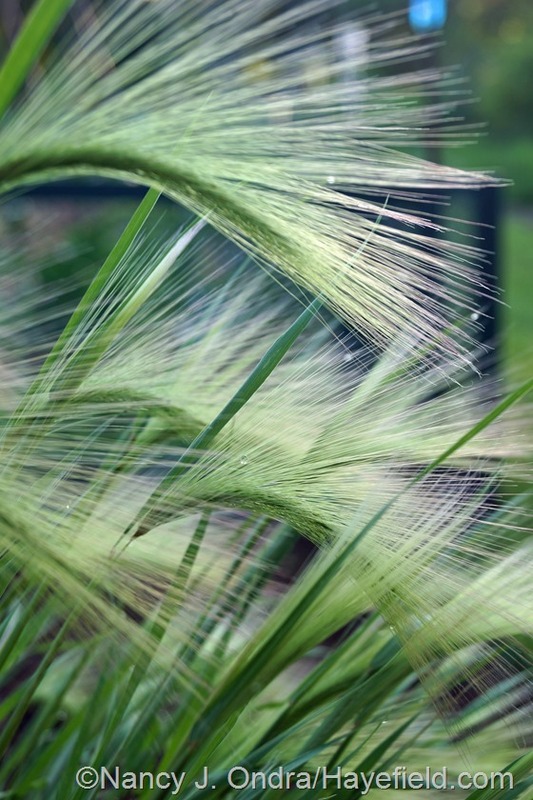 A new favorite in the green category: foxtail barley (Hordeum jubatum). …but it perks up again when it dries out a bit. 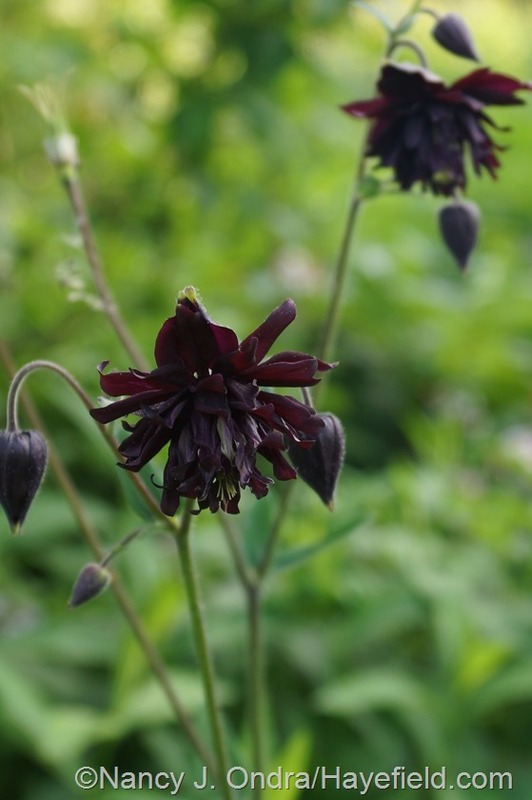 To finish the perennials, a lovely “black” columbine (Aquilegia)–a seedling of a seedling of ‘Black Barlow’. 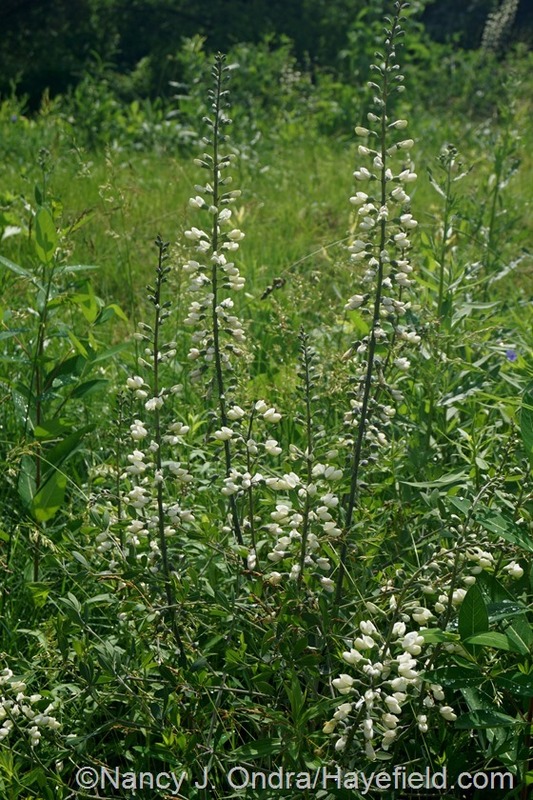 …and the one below is pale leatherflower (Clematis versicolor). The blooms of my two look almost identical, with Addison’s (on the left) consistently just a bit smaller. 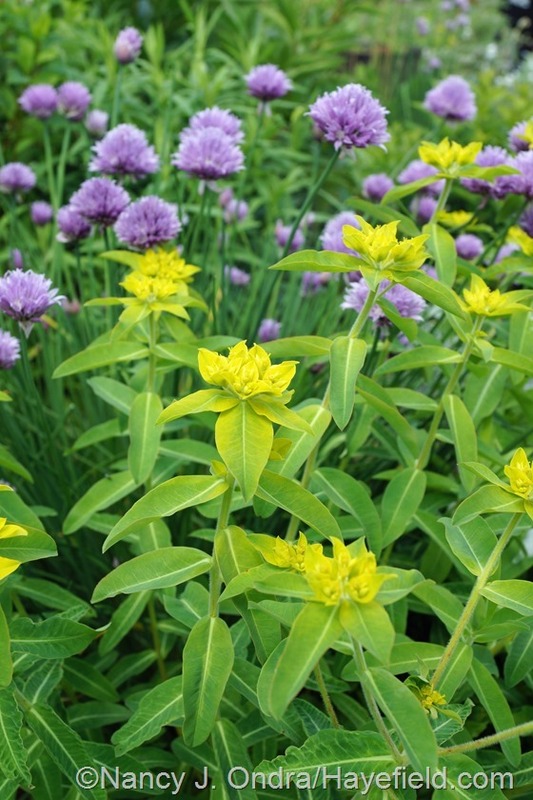 The leaves are different, though, with Addison’s (on the bottom) being thicker and kind of glaucous compared to the brighter green pale leatherflower foliage. 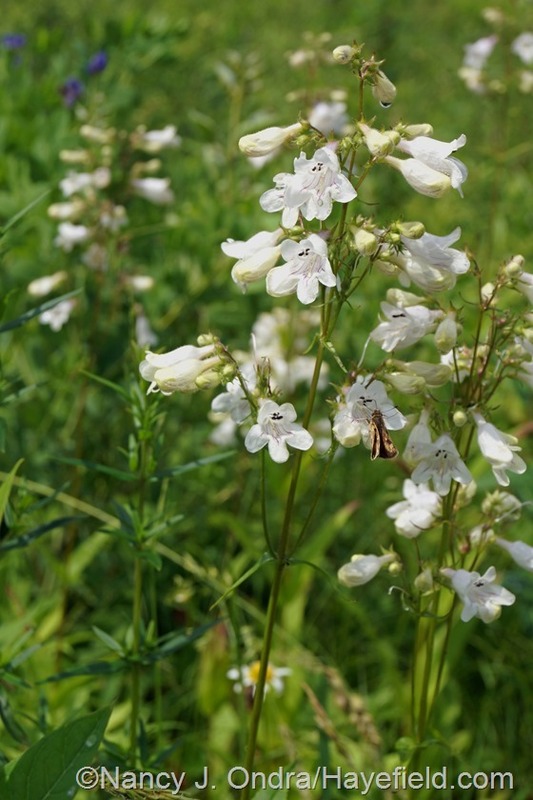 The plant I think is Addison’s also stays much shorter–to about 18 inches–while pale leatherflower scrambles loosely to about 4 feet. 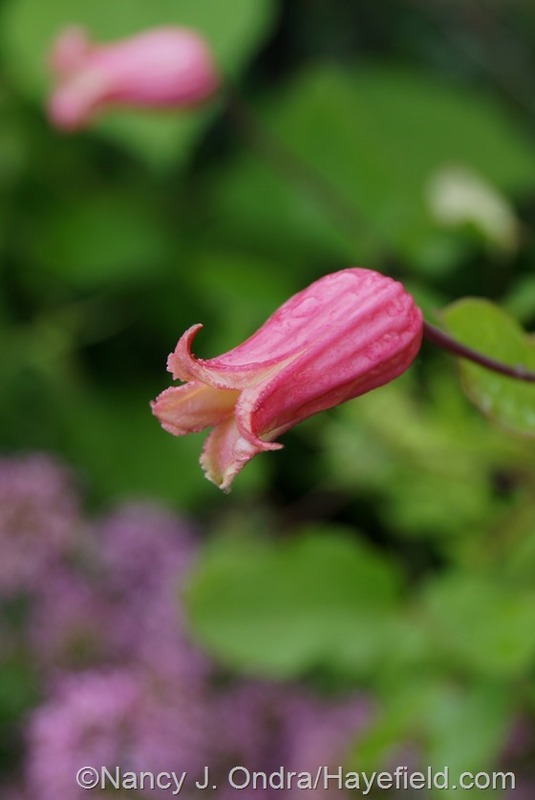 This one, I’m pretty sure, is Clematis glaucophylla. 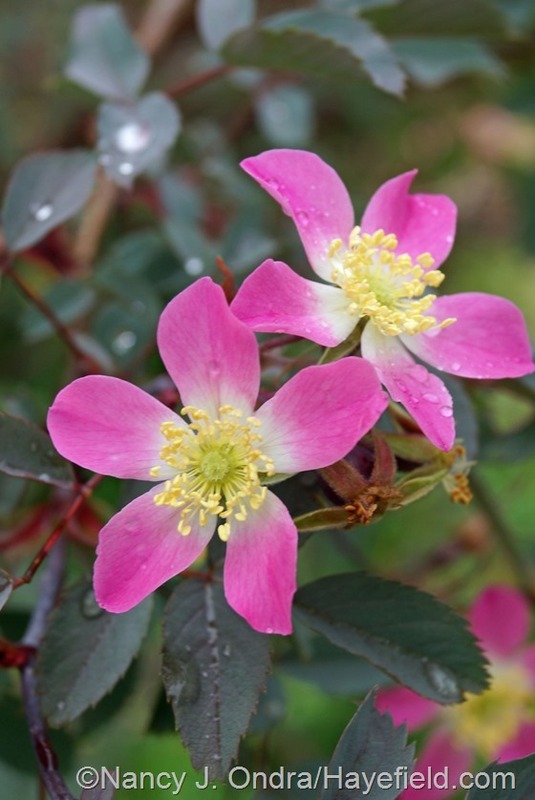 …and Rosa achburensis (the next two below). 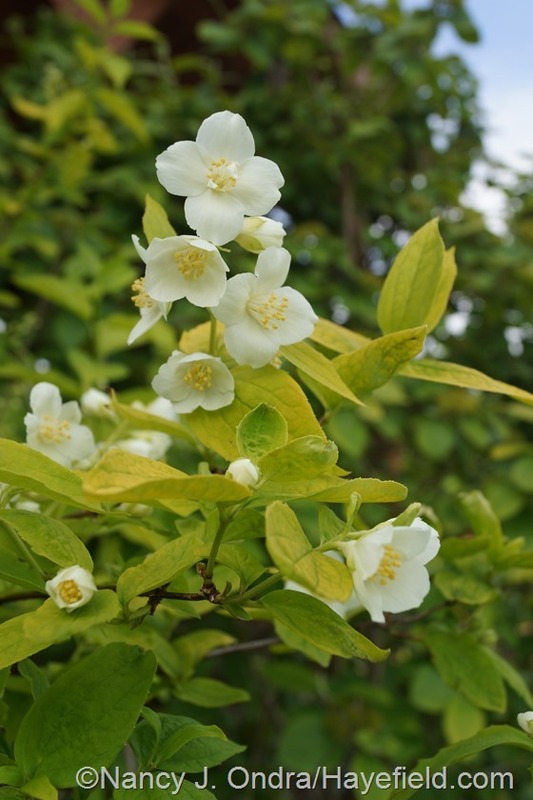 …and the sweeter-scented golden mockorange (Philadelphus coronarius ‘Aureus’). 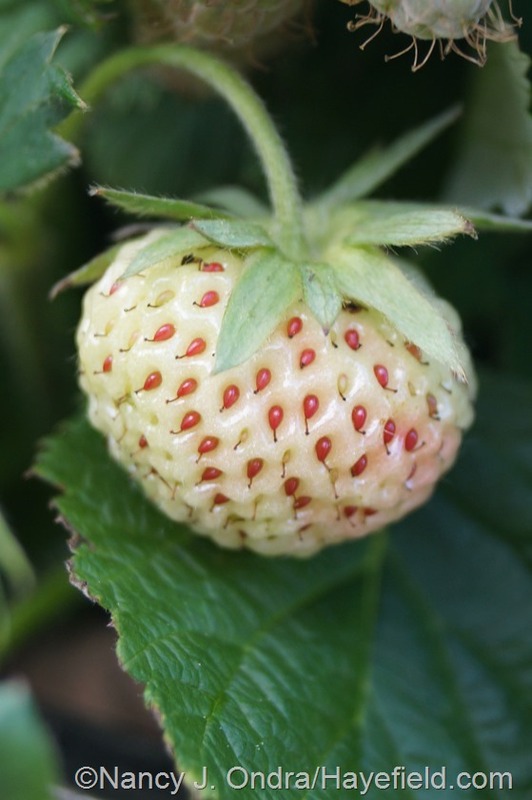 One neat fruit so far: ‘White Pine’ pineberry (Fragaria x ananassa). If you’ve made it this far, thanks for taking the tour! 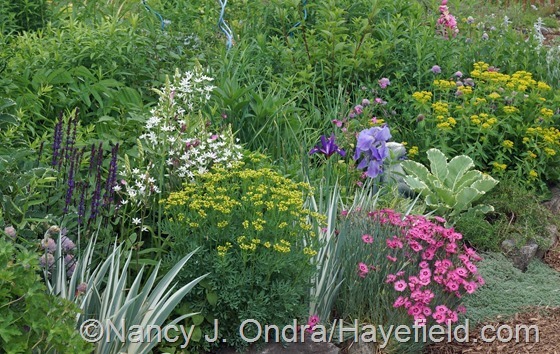 For more June garden goodness, be sure visit Carol’s main Bloom Day post at May Dreams Gardens. 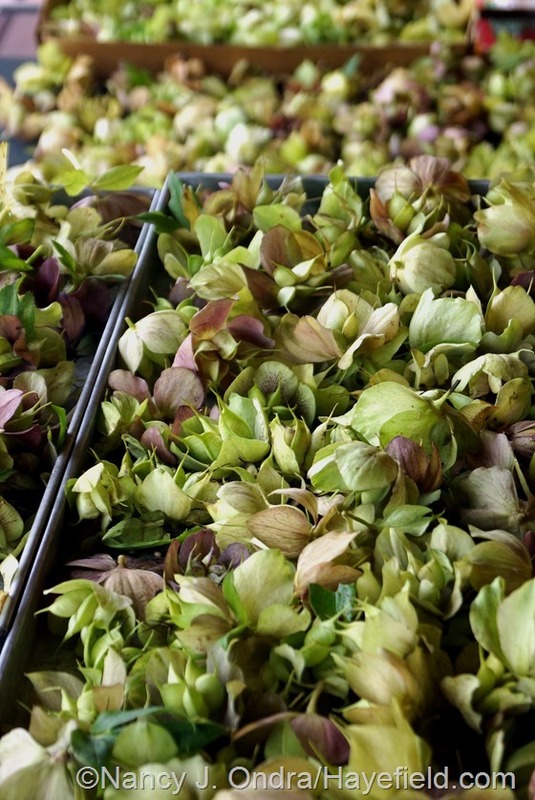 And hey, one bit of news: If you’d like to try your hand at growing hellebores from seed, I collected loads of seedheads from my favorite plants a few days ago and have them in my Etsy shop: Lenten Rose Hayefield Hybrids (Helleborus x hybridus) on Etsy. They’re less than a week old today, so you can’t get much fresher than that. If you sow them right away, you should have seedlings by late fall this year or early spring next year. 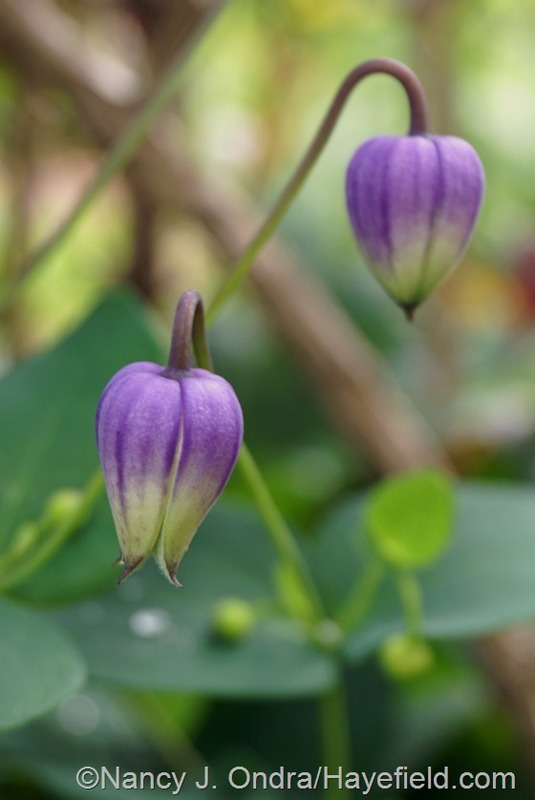 I have fresh seed of checkered lily (Fritillaria meleagris) listed there as well. And to celebrate the arrival of summer, I’ve also put the Hayefield Highlights notecards on sale! 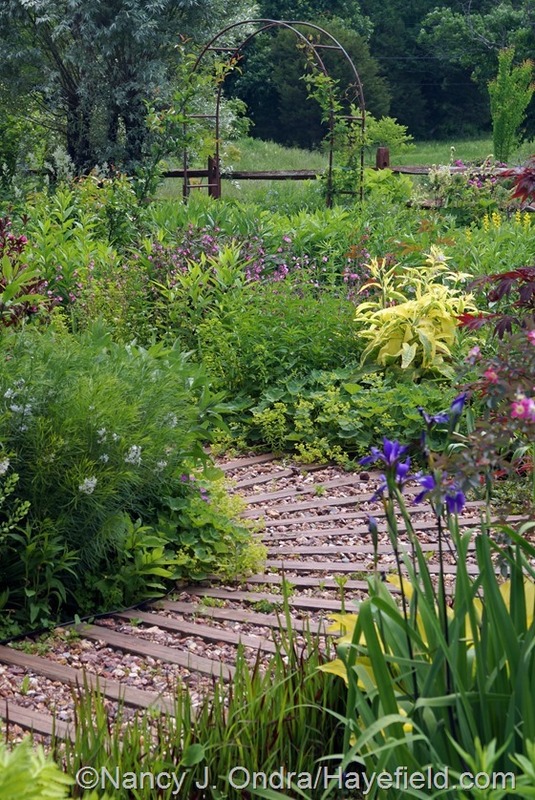 Amazing garden and amazing pictures! I’m so glad you visited today, Lena. I wish you a wonderful June day in your Andalusian garden! What a great way to start the day, scrolling through your beautiful photographs! 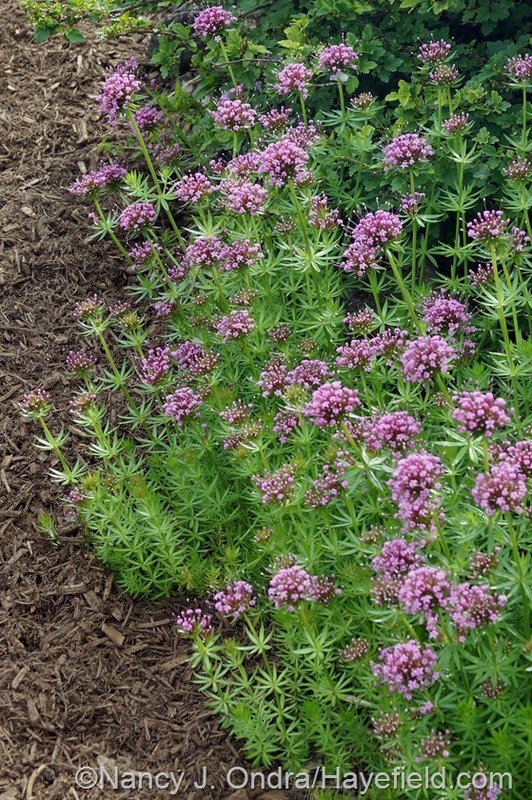 Your plant choices and combinations are always inspiring. Thanks so much. 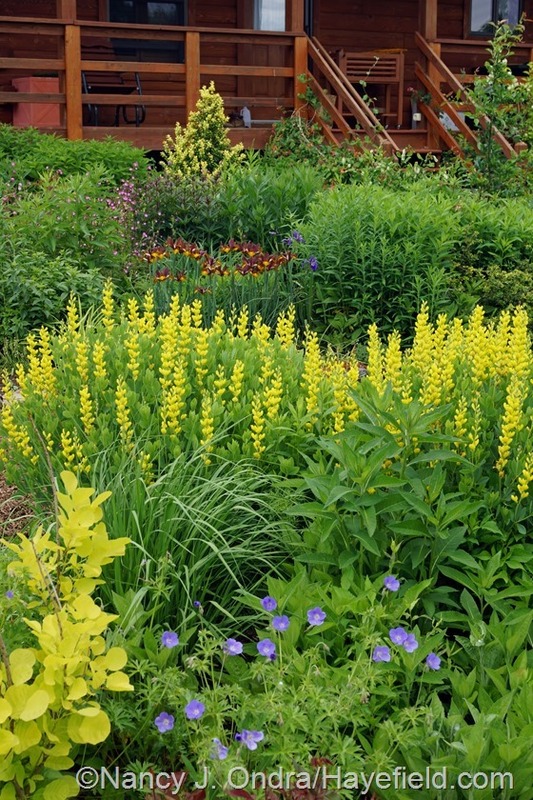 It’s hard not to get carried away with the abundance available in a June garden, isn’t it? I hope you’re enjoying your own garden today, too, Kimberly. Amazing that you got such great photos after the winter and spring we’ve had! Yes, there were some surprising plant losses, but the remaining plants seem to be thriving so far this year. Congratulations on the show of your gorgeous watercolor this month at the McGuffey Art Center in Charlottesville, Virginia. I hope the opening went well! Thanks so much, Christine. I love seeing them too. Happy Bloom Day to you! Nan–your blogs always make sparks! Thanks for the tip on Special Plants. Hi Bruce! 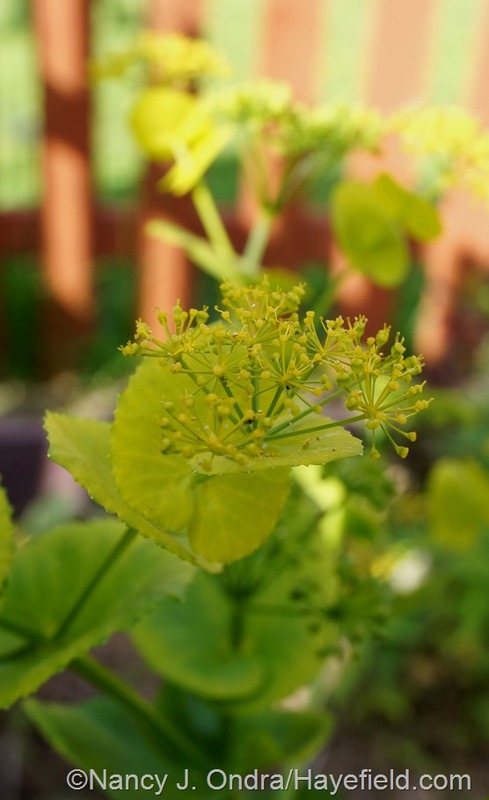 Besides being a great place to find uncommon species and seed strains, Special Plants is my go-to source for seeds that are tough to germinate unless they’re really fresh, such as the Smyrnium perfoliatum. I recommend visiting her site several times a year. Your irises are lovely. They’re only a memory here now. 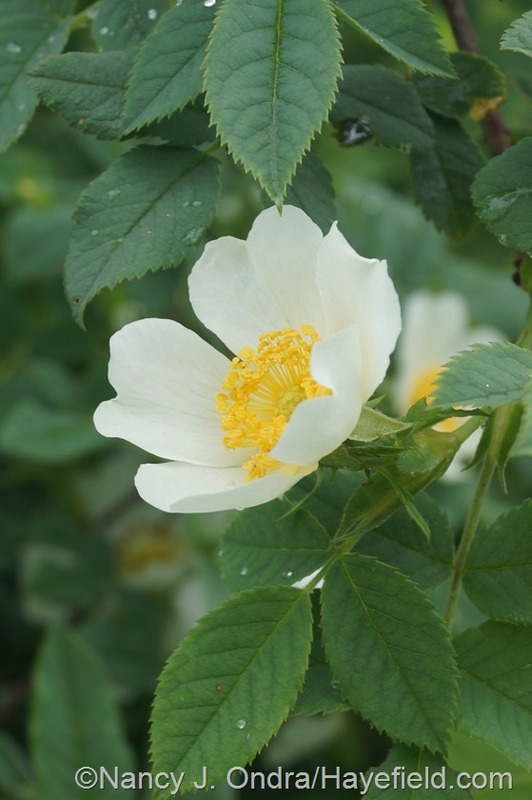 Maybe I should look for a golden Philadelphus since my white one has no no fragrance. I wonder if you have Philadelphus inodorus, Nell Jean. 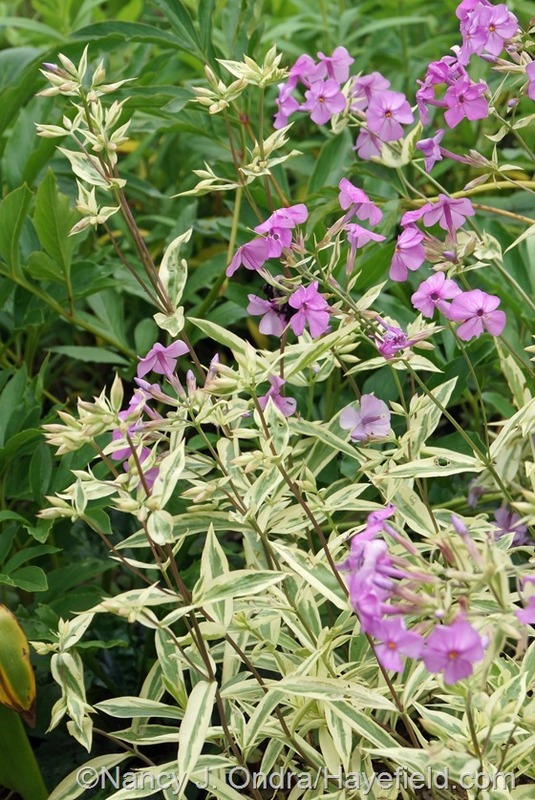 I’ve grown P. coronarius ‘Aureus’ and ‘Variegatus’, as well as the variegated hybrid ‘Innocence’, and they’re all wonderfully fragrant. 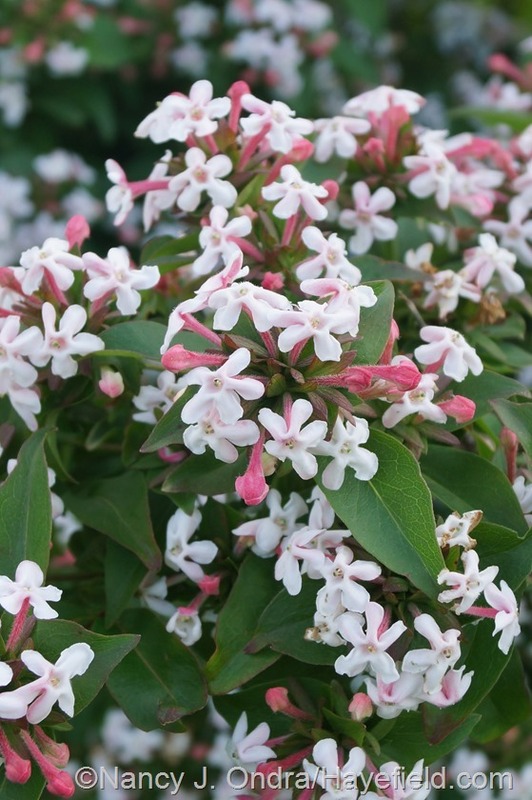 They’re very nice near a deck or patio, where the heavier scent of Abelia mosanensis could be overpowering. The transformation of your garden from winter to late spring/summer amazes me. Your rain shots brought a vague recollection of a song from the musical version of “Camelot” in which Guinevere imagines a land where rain only comes at night and the days dawn dry and clear. Still, I envy even your untimely rain – we got so little this year and can’t reasonably expect more until October. 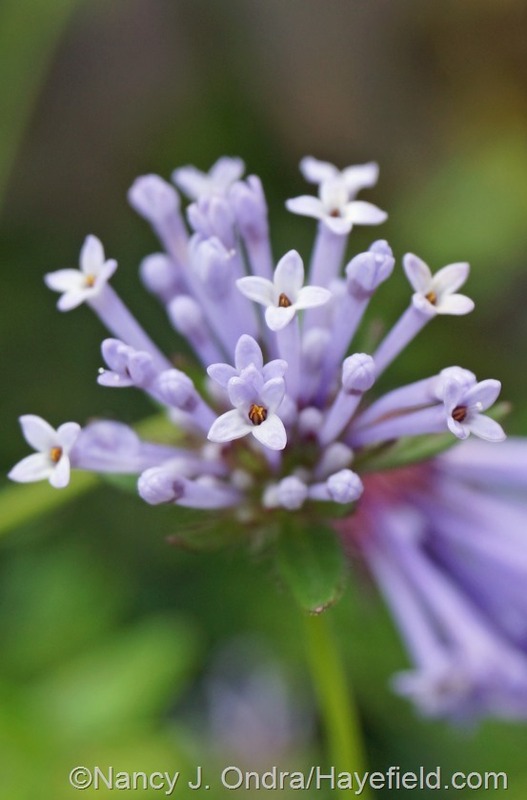 Your featured plants always send me to my western garden guide to uncover what might work for me here in Southern California – I’m going to look for Amsonia, Phlomis tuberosa and maybe that Ornithogalum magnum. Happy GBBD, Nan! Guinevere–or whoever wrote that version of her–was obviously a gardener. I’ve often thought the same thing! I’m so glad you saw a few things of interest, Kris, and I hope you’re able to grow some of them. That Ornithogalum magnum surprises me each year with its delicate spikes and long bloom period. Even better, though: it doesn’t seed aggressively, the way some other Ornithogalum species can. In fact, I’m not sure mine has ever set seed at all. Nan I always love your posts! 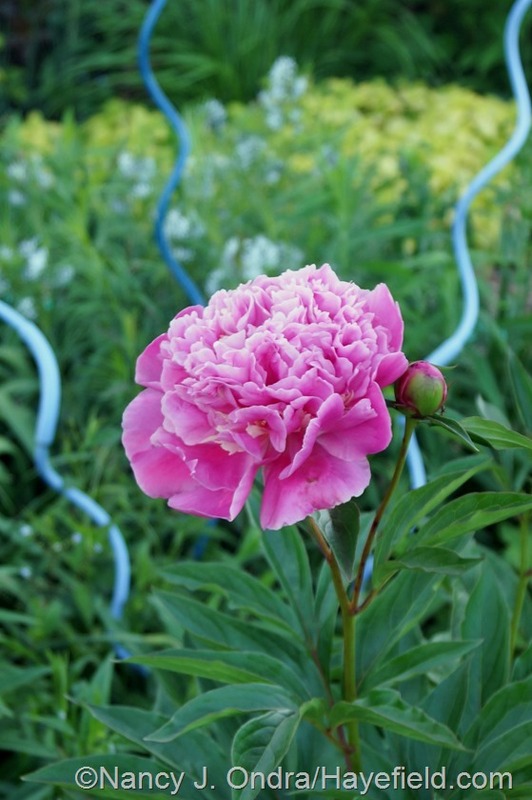 Good photos, good descriptions, and good explanations of why you plant what you plant where you plant it! :) Keep up the good work! You’re so kind, Kelly. I love doing these Bloom Day posts, and knowing that readers like you enjoy them makes them even more of a pleasure to put together. Have a wonderful summer! I absolutely love paging through your plants in bloom, your garden is amazing. I took the liberty of passing your post on to my Facebook friends who will really enjoy your blog as well. Hey there, Charlie! I’m honored that you thought the post was worth sharing; thank you so much. I hope your own garden is pleasing you as much this year. Happy Bloom Day! Always wonderful images Nan, I enjoy a multi-day savor of your bloomday posts. Do you use a tripod at all, or are all your photos handheld ? Ooh–“a multi-day savor”? I like that – thanks! I’ve tried several times to get into the habit of using a tripod, but I just don’t have the patience for it, so now I always hold the camera one hand and balance it with the other. It has been great weather lately and everything in your gardens look beautiful. 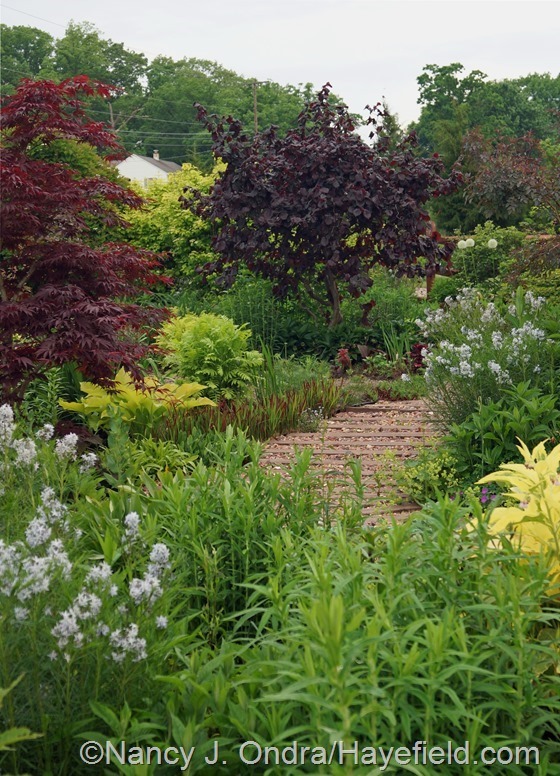 I’m amazed that I’m not far from you (in Philly) and yet you’re about two weeks behind my garden (e.g., my baptisia and peonies have been done for at least a week). Looks like we’ll be getting a shot of our usual summer heat and humidity this week, Kathryn. I bet we’ll be at the same stage as you within the next week or so. Now we can worry about when we’ll get rain again. The plants are used to almost daily doses of water at this point! Nancy, a couple of questions for you. 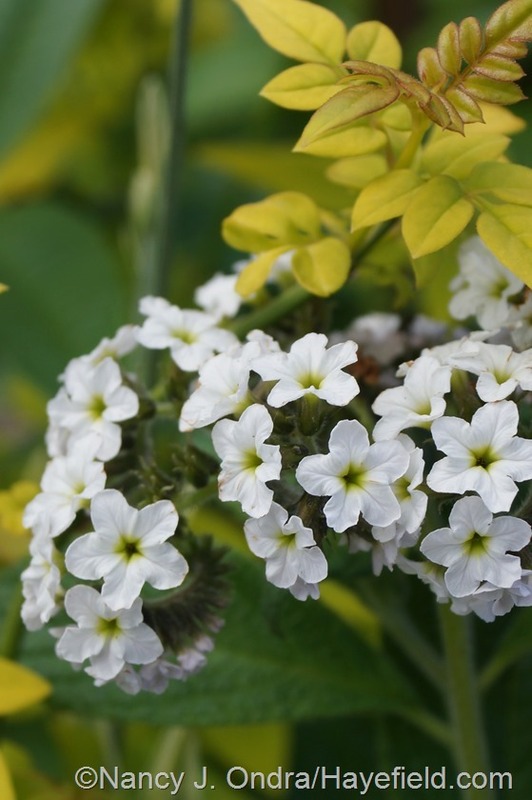 First of all, for someone who admits to not really liking the color white, you sure do seem to have a lot of white flowers to share this month… ;) That said, you have mentioned why you have many white flowers in your posts before, but i admit i was surprised to see a picture of Heliotropium arborescens ‘Alba’. Why did you decide to grow this white flower when you could have chosen the regular colored form (that’s mauve or lavender, i believe)? Second of all, I was intrigued by your picture of the ‘Lion King’ Dutch iris as i’ve never seen pictures of dutch iris foliage before. 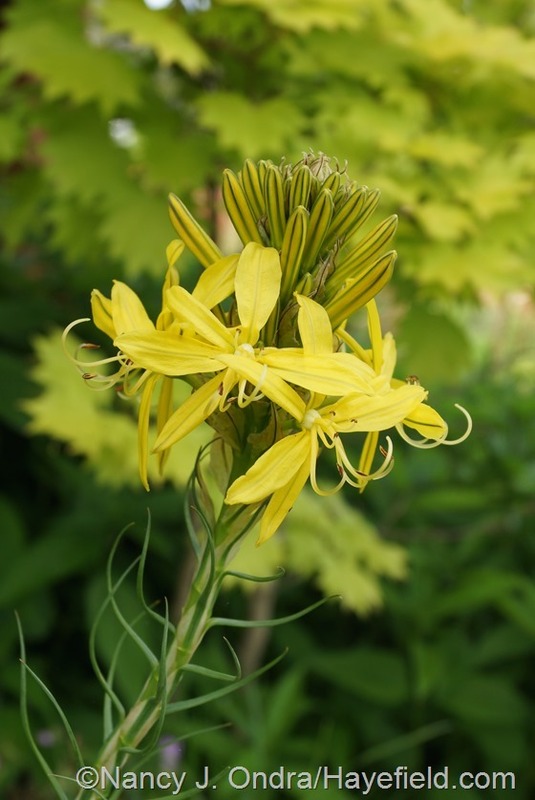 (granted, i’ve never looked very hard, but still – you never see the foliage presented in bulb catalogs…). 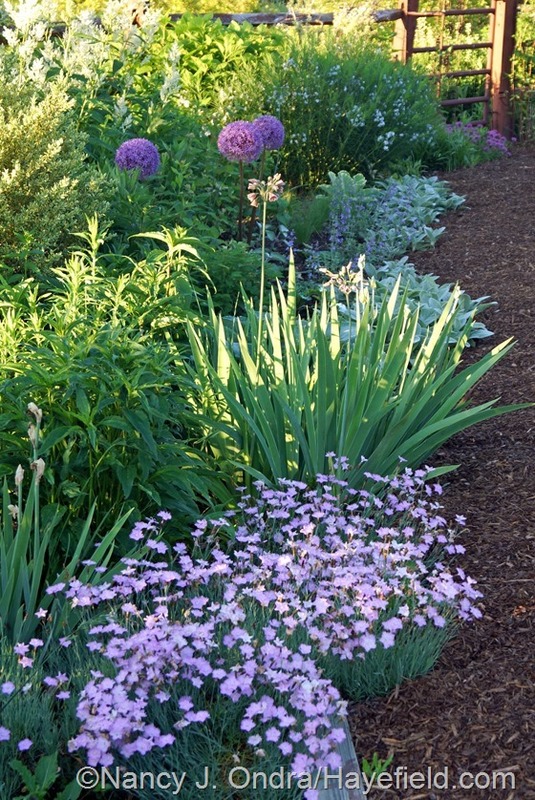 How does that allium looking foliage hold up during the year? It looks like it doesn’t carry the foliage interest as, say, siberian irises but doesn’t look big enough to be a burden like the foliage of bearded irises. Oh, sure…call me on my inconsistency, Jeffrey! I do have and adore the regular purple heliotrope, but I needed the white one for a container combination this year. And I like having it around anyway, for its baby-powder scent. 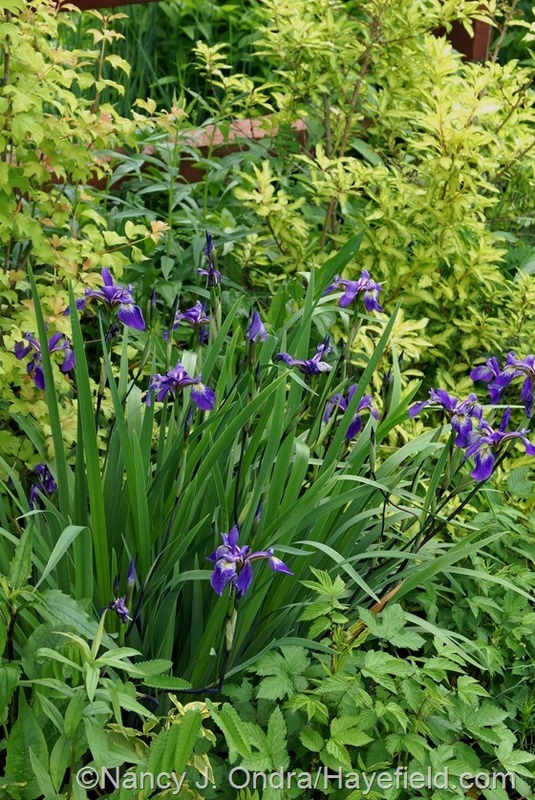 There’s a good reason you usually don’t see pictures of Dutch iris foliage: It’s really not attractive, and it quickly starts to turn brown, sometimes even before the flowers are finished. I can’t remember exactly when it goes dormant naturally. I leave it as long as I can stand it, then cut it to the ground at some point in July. As far as the baptisias, I agree with you about B. alba; that’s mainly why I have it in the meadow and not in the garden. 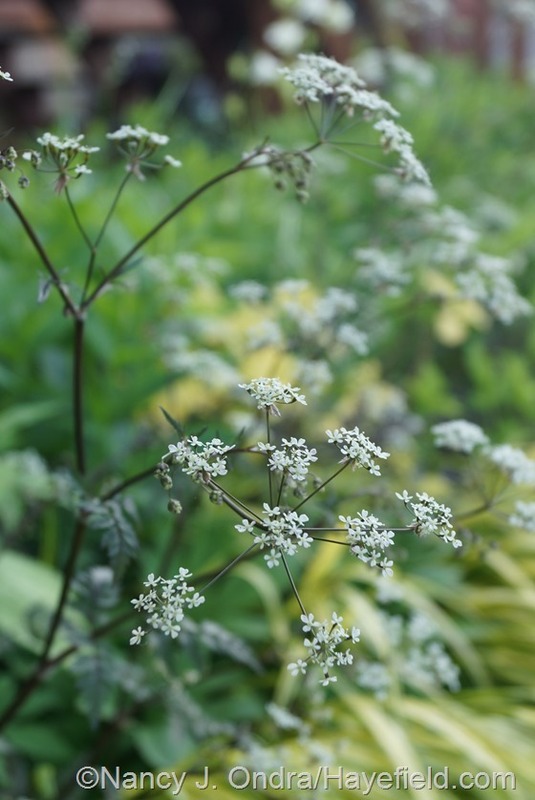 The trick I use on my garden clumps is to cut them all back to about 1 foot as soon as the flowers are finished. They look icky for a couple of weeks but then leaf out and are handsome and bushy for the rest of the growing season, with no flopping open. That actually works pretty well on B. alba too: when I mow that part of the meadow in late June to knock down the Canada thistle, I have to mow the B. alba clumps as well (down to about 4 inches), and they come back looking quite nice. 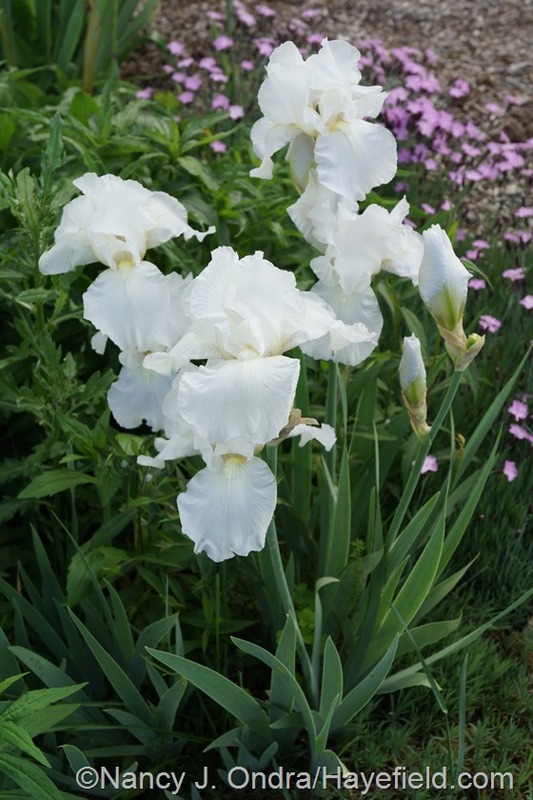 I’m also slowly replacing my bearded iris with rebloomers because even a few blooms in the fall greatly increases their garden value. 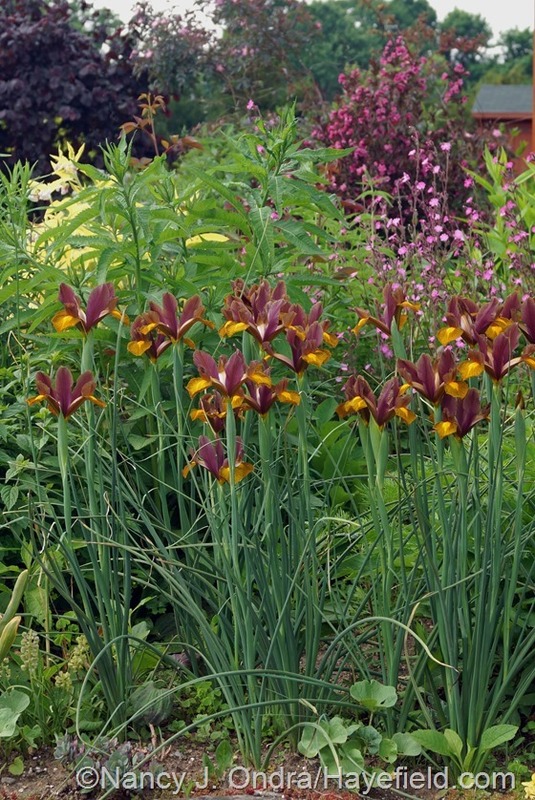 Now if only they could come up with reblooming or everblooming siberian iris ! That’s a pretty one, Jesse. I agree with you about the reblooming beardeds. ‘Immortality’ has been very reliable for me, and a great increaser. Would we really want everblooming irises, though? Maybe their exquisite flowers wouldn’t seem as special then. Everything in moderation, rain included! So glad you’ve had a good gardening season. The views of your garden are so lovely. I’m trying to revive my interest in gardening. I’ll drop you a private email. Great to hear from you, Freda. I appreciate you taking the time to visit and comment, with everything else you’re dealing with. I wish you all the best. I had a lot of losses this year and moved some things around including my Gerald Darby, just too big for where it was. I am rethinking what I grow in regard to zone fringe plants, even my Sweet Autumn Clematis bit the dust after eight years! Aw, sorry to hear that, Eileen. 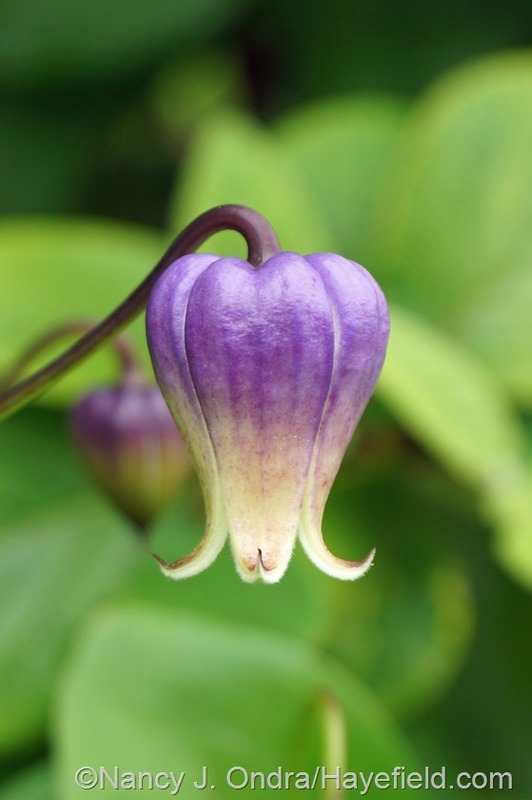 I lost a long established Clematis viorna, while two other species in the same bed are just fine. I lost all my common comfrey, too. 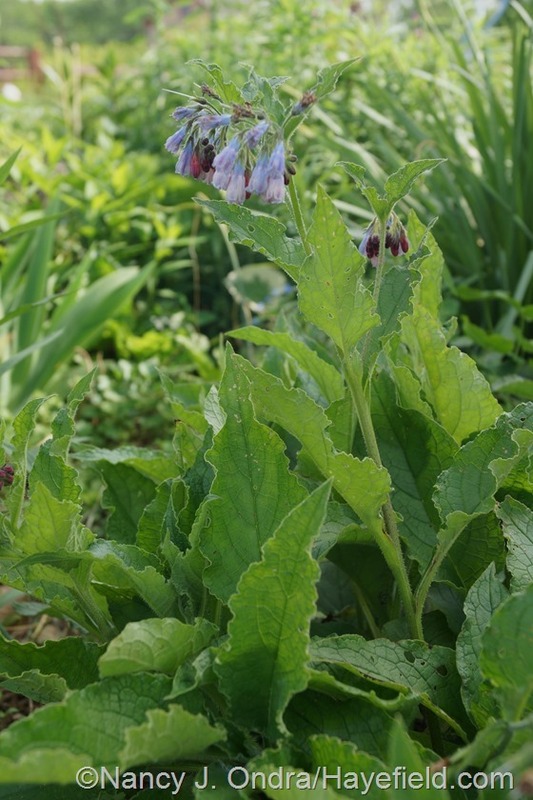 Who kills comfrey? Back at ya, Dee! It’s a glorious time of year, isn’t it? Your gardens are beautiful, as usual. I love the foxtail barley. 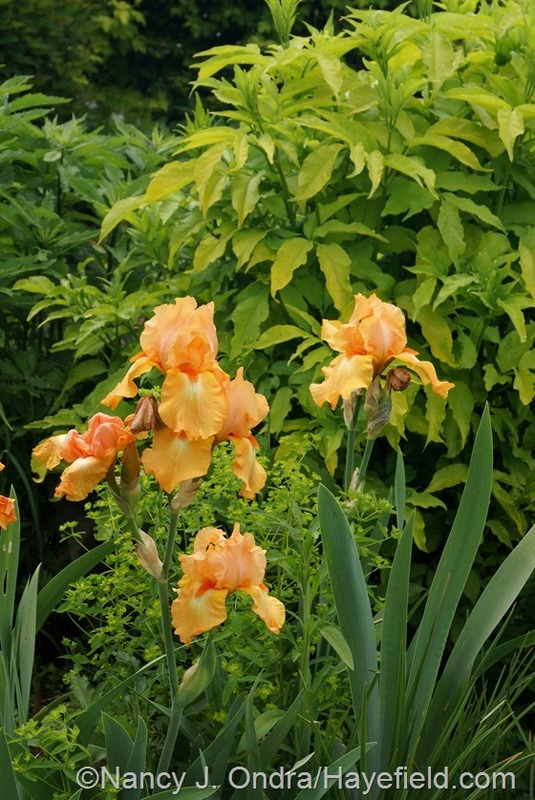 That ‘no name’ orange bearded iris is nice too. Hey there, Mel. 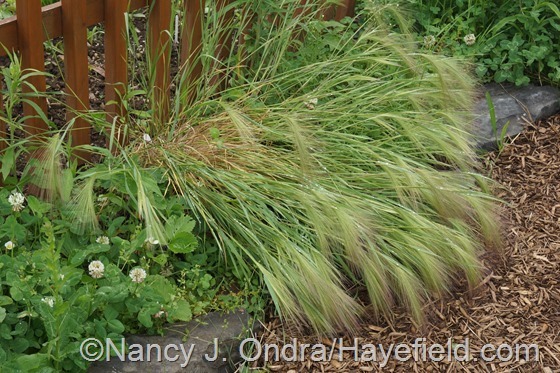 I’m going to make sure I collect seeds from the foxtail barley, so I should have lots to share. I wish I knew the proper name of that iris. I just call it “Gerald,” after the person who gave it to me. p.s. 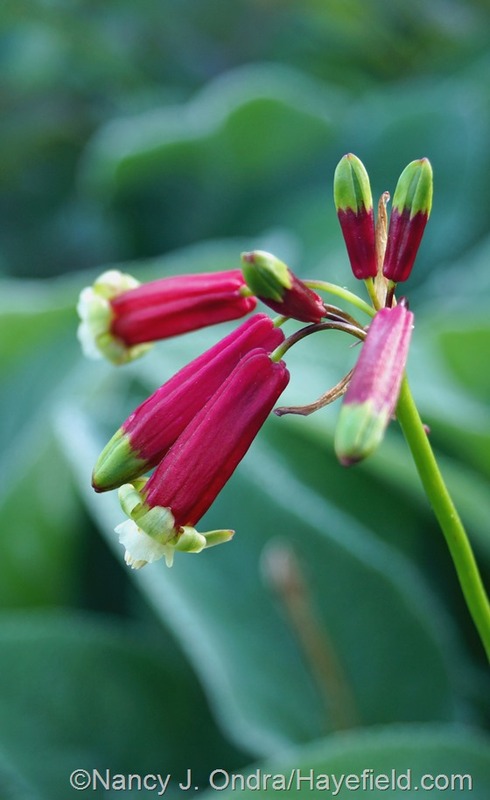 the tassel flowers are turning out to be one of my favorites this year. Thanks for the seed. Still waiting for the Moldova marigolds to bloom. They’re growing like mad. 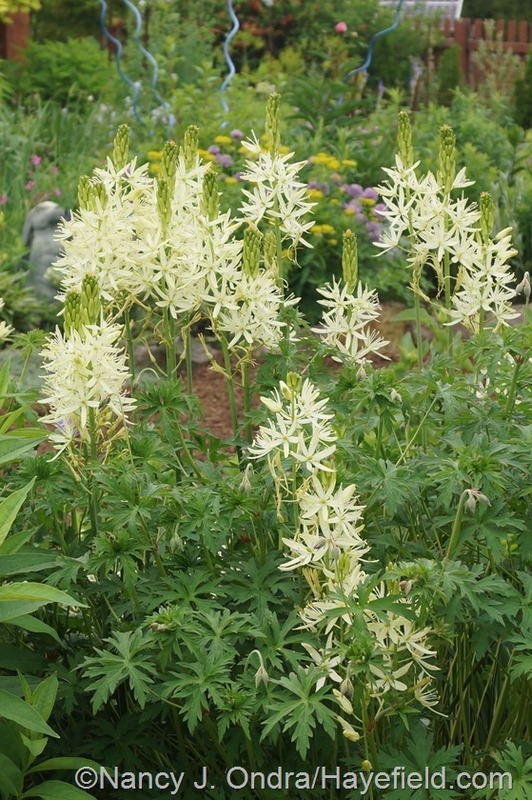 I’m still waiting for my tassel flowers to start blooming, and my ‘Moldova’ as well. 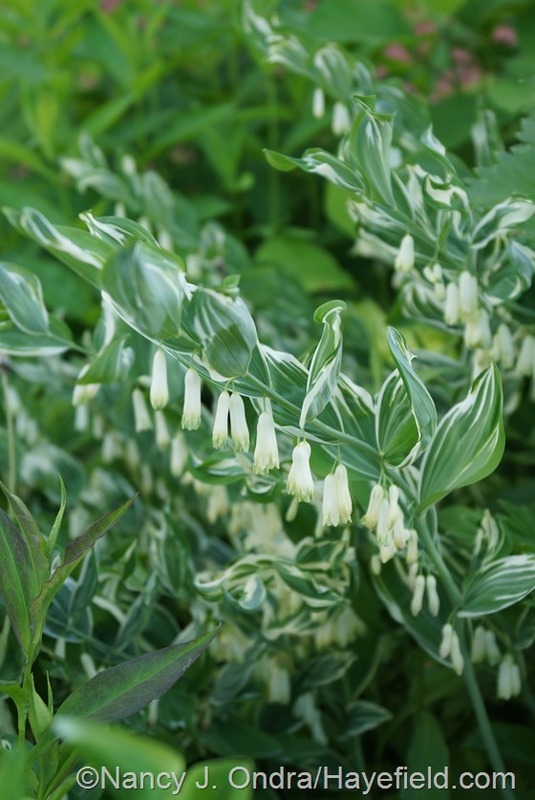 The ‘Dreadlocks’ love-lies bleeding you shared with me is going to be spectacular this summer, I think. Usually, I have a hard time getting amaranths past the seedling stage due to them getting chewed to lace by cucumber beetles, but, for whatever reason, those pests have been scarce this year. I enjoy your blog and all the wonderful pics. I believe I’m pretty near to you. I’m in Haycock by the Nockamixon State Park. BTW did you, or anyone else, notice a poliferation of new poison ivy seedlings everywhere this spring? I’ve pulled hundreds that I never had before. Well, hello, almost-neighbor! Ugh, yes about the poison ivy. I found dozens of seedlings just in one area when I was out cutting back perennials this evening. Lots of black walnut seedlings everywhere, too, which is kind of crazy, because I don’t have any black walnut trees on my property, and the nearest ones are at least 300 feet away. Good to hear from you, Helene. Thanks for taking the time to visit today. I hope you, your pups, and your garden are doing well! It’s always such a treat to “stroll” through your delightful gardens, Nan, via your beautiful photos. 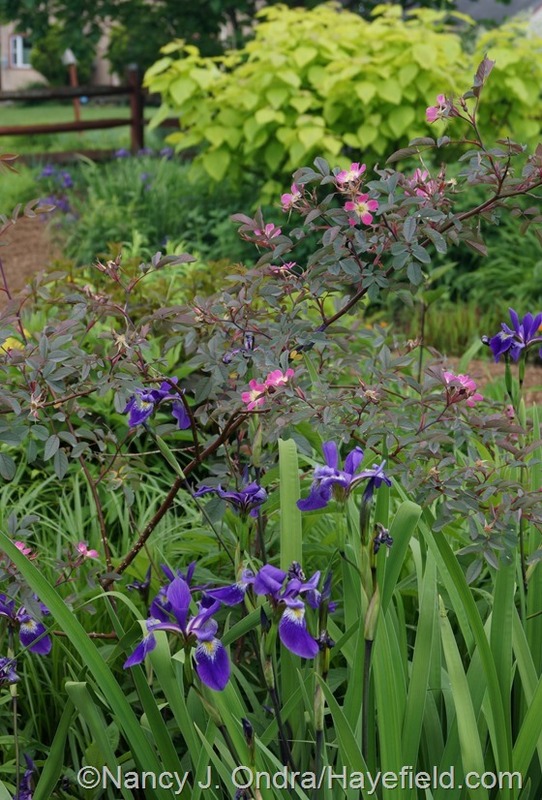 Lots of interesting blooms and some lovely favorites.I love the rich blues of the Siberian iris and Baptisia. 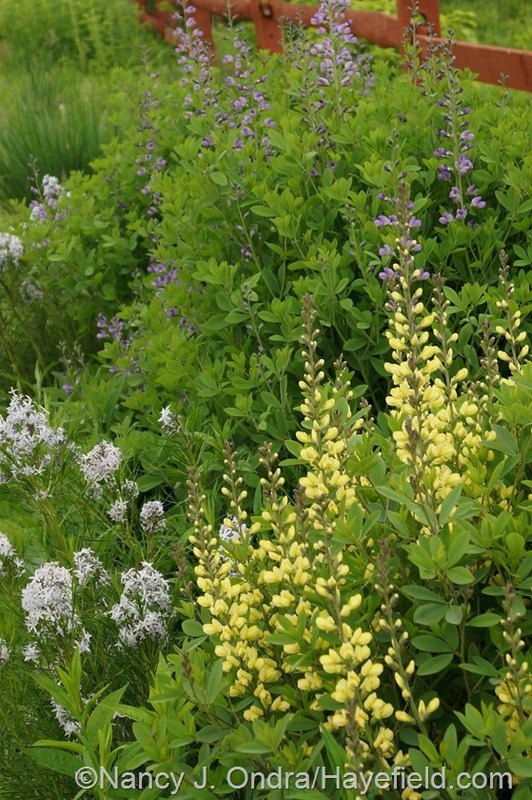 I’m going to cut the Baptisia foliage back as you suggested…thanks for the tip! That deluge was really something, wasn’t it? And it apparently covered a very wide area. You got some great photos of it. June is such a lovely month in the garden. You must work very hard to keep everything looking so beautiful and well cared for. Thanks for sharing your treasures! Hi there, Kerri! Actually, things look pretty rough here at the moment, since I’ve been busy cutting back most of the perennials over the last two weeks. It should fill out again very soon, though, now that we’re getting lots of sun. I hope you’re enjoying some beautiful summer weather up your way! Wow! Wow! Wow! Thanks for the shot in the arm, Nan. It’s such a tonic to see such well thought out abundance and I’m so happy you have been getting regular rain spells. It has been dry here in Victoria, BC for almost 2 months with only 2 rain showers in that time. Having said that our persicaria polymorpha is living up to it’s common name, ‘Giant Fleece Flower’, and is approaching 8 feet. 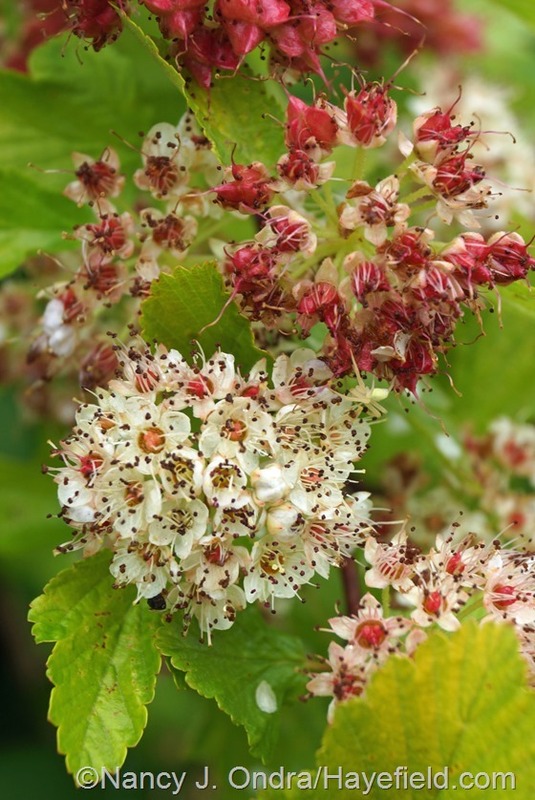 Question for you, Nan, as I saw a beautiful specimen in your garden: If one deadheads the blooms will more come? I haven’t tried this and usually let them go what garden writers refer to as ‘pink’. In our garden they they turn a shrivelled, yucky pinky brown. Other than that, I agree with Mel above; the unknown orange iris shot and the foxtail barley seemed to have captured my imagination the most. Thanks, again. Your generosity in sharing all this matches that of your plants. PS. Looking foward to when your etsy products are available to your neighbours up north. Hi Barbara! I occasionally see later blooms of the giant fleeceflower, but usually not after early July. It was a tough decision to do U.S. shipping only at my Etsy shop. But with such high postage costs these days, and with having such horrible luck with things getting lost when I send them outside the U.S. and then having to replace them, that I end up losing money almost every time I try foreign orders. Always a beautiful experience to visit your garden. Hey, I love that foxtail barley. Did you buy it as a plant or grow it from seed? I’d love to try some down here in Texas. Hi, David! 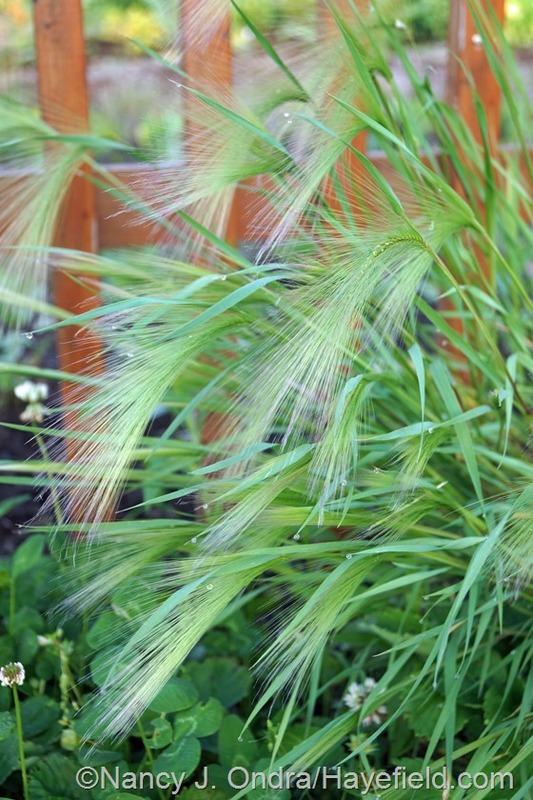 I received seed of the foxtail barley last year, labeled only as “iridescent grass from Venlo,” from a friend who collects seed of almost anything he can get his hands on. We were very pleased to see it flower this year and figure out its identity. This cool-season perennial grass is native to many parts of the U.S., but apparently it can be very troublesome for livestock who eat the bristly heads. I’ll have to make sure I collect all the heads for seed so the boys don’t get them. 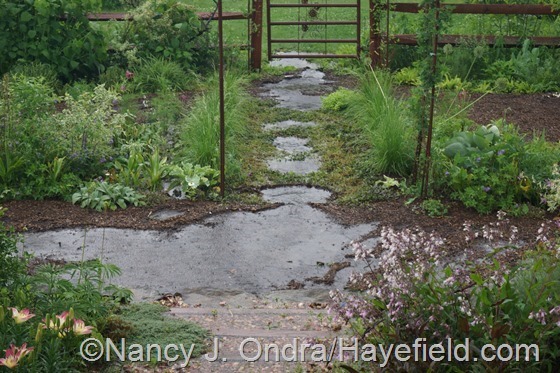 I always love strolling through your gardens (even in the rain). It always leaves me with things to do in my own space. I am grateful for the inspiration and so is my new garden. Your comment made my (rainy) day, Shell. You’re at the start of a very exciting adventure, and I wish you…well, not *complete* success, because the mistakes you’ll inevitably make can end up producing some surprisingly positive results…but enough good luck and happy times to keep you energized and enthusiastic to try new plants and new techniques each year. 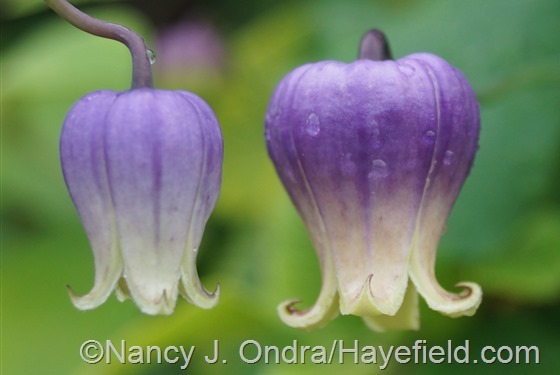 Thanks so much for the beautiful images, as always, and for the Etsy offering of fresh hellebore seed. I planted mine (thanks for the bonus!) today. 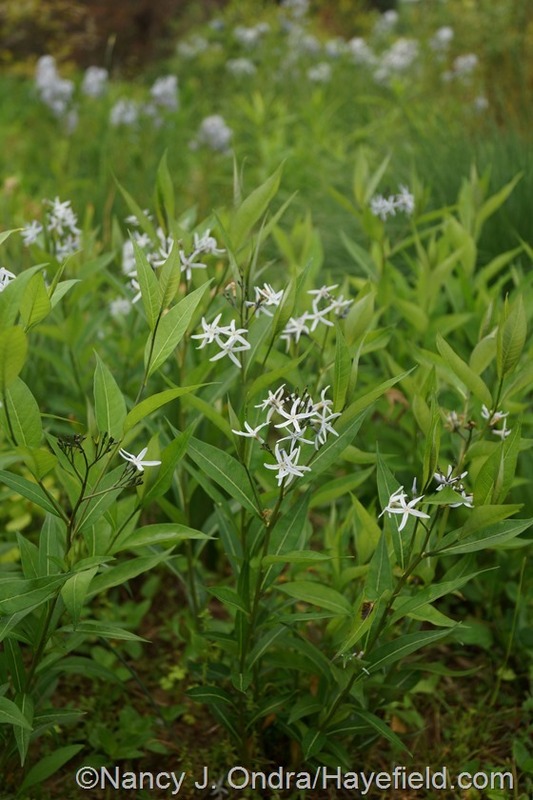 Thanks also for the seeds of Amsonia hubrichtii last winter. My second try at germination (with extra heat) was very successful, and a couple dozen young plants already have me looking forward to next summer. 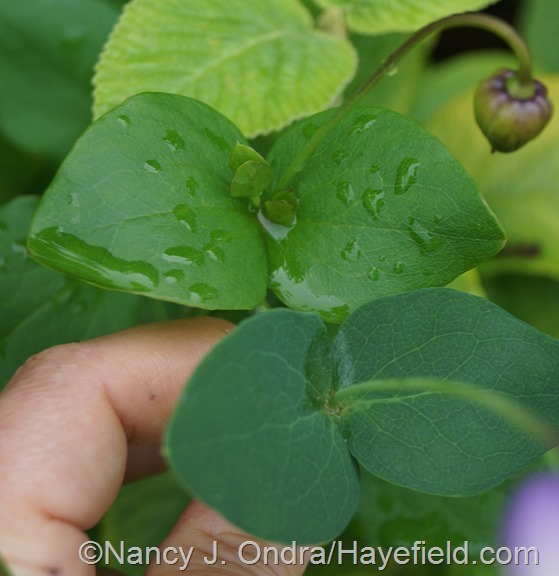 I’m so happy to hear that the hellebore seeds arrived safely, Michael, and that the amsonia seeds finally came through for you. Your seeds (now seedlings) are still performing admirably here! Hi Allan! 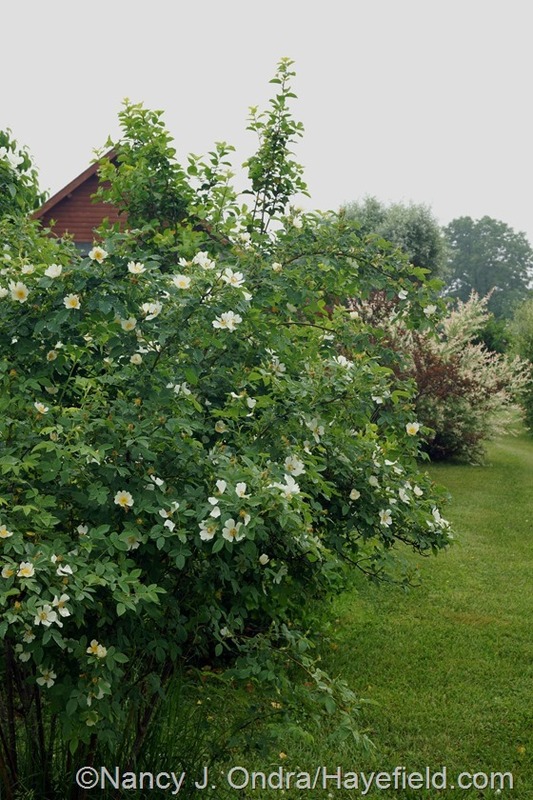 That ‘Moore’s Striped Rugosa’ rose is charming at its best, but–for me, at least–it’s not a very vigorous or pretty plant, and the flowers look absolutely dreadful after just a day or two, or if there’s rainy weather. Congratulations on your new hot-color acquisitions! And, er…I’m puzzled about the feature in Garden Answers, because I didn’t actually write anything for them. Is it available online? 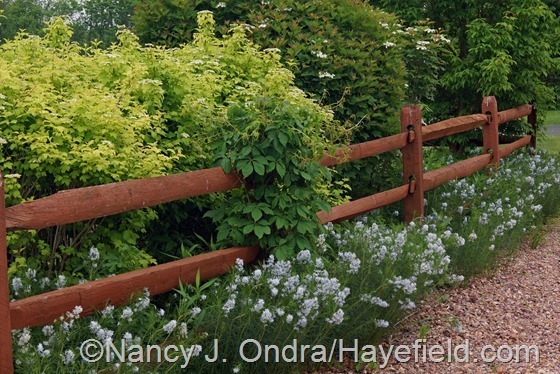 Beautiful pictures, and your garden really does cover such a wide range of plants. 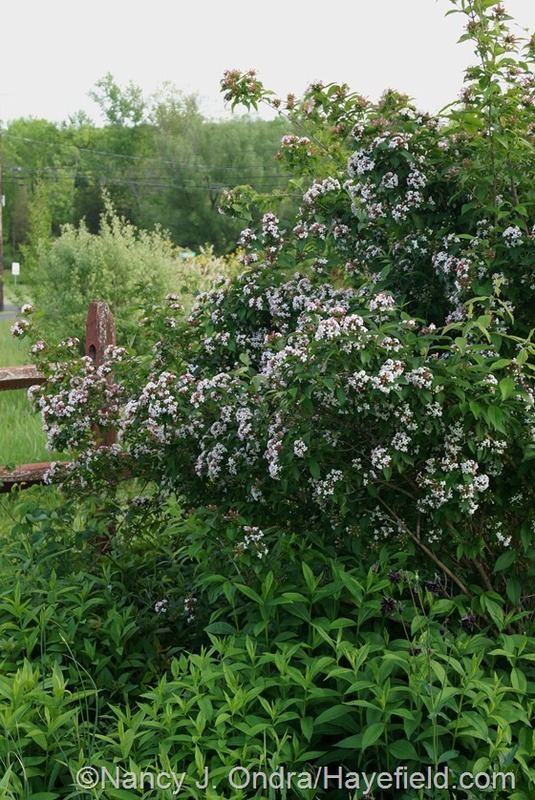 Your shrubs really seem to be taking off, is this mostly the new shrub border? Your mention in your last post about the amount of work that goes in to your garden made me feel much better about the state of my own. I didn’t have as much time this spring, so it does have its messy spots, but I feel better about it now. Maybe in the next few days I can finally get on top of things and get those last bulbs and annuals planted as well as the mess of perennial still looking for a home! Good morning, Frank. I wish you good luck in getting your planting finished. I did what I thought was my last batch of planting last week but just found another flat of perennial seedlings to find room for. I still haven’t gotten all of the garden ornaments out, either. It’d be nice to get that done before frost! Yes, the shrubs are looking pretty good this year. The ones in this post are pretty much scattered throughout the garden.